Spring is springing and I am finally getting out from under the kitchen and out into the yard. Honestly, getting my back used to the strain of yard work has not been fun, but being out in the sunshine with birds singing and the scent of flowers in the air has been reviving. 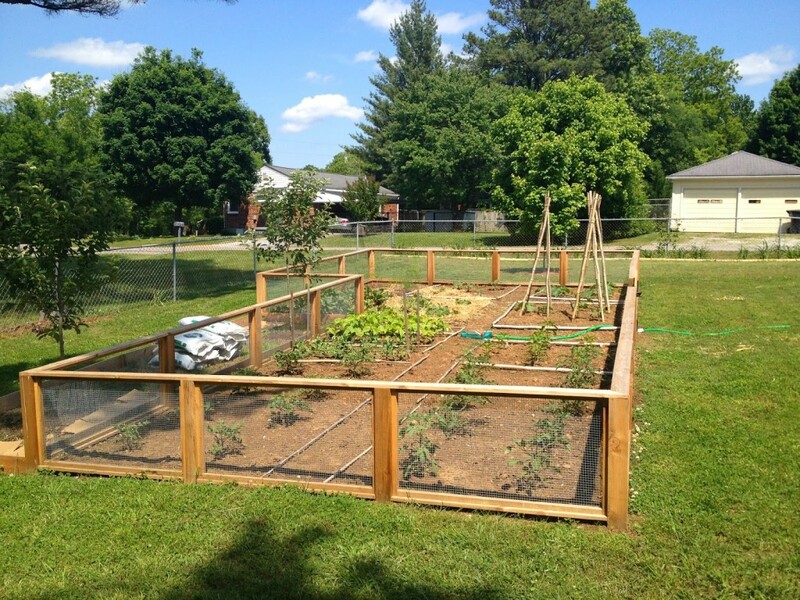 This weekend, my goal was to get the vegetable garden in shape for planting. 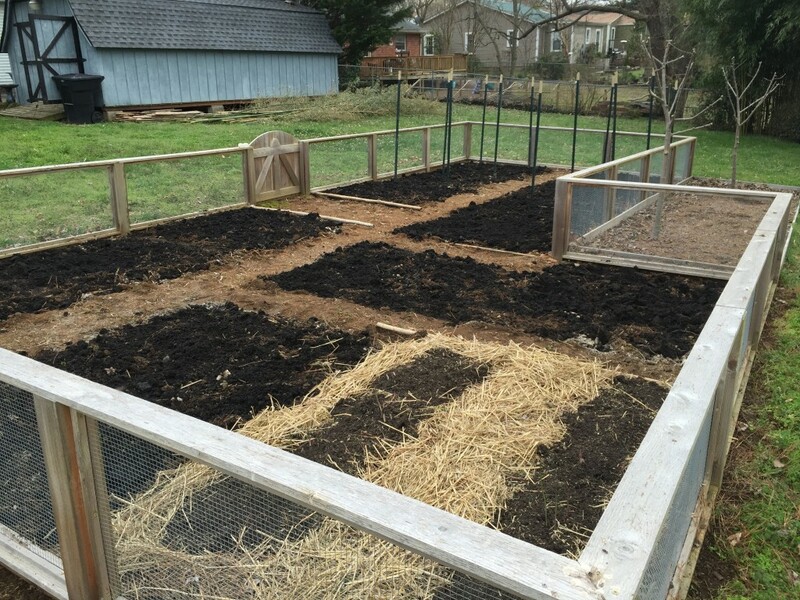 It is still too early to plant anything (growing season begins April 15th-ish in TN), but preparing the soil is key for the success of a good crop. Over the past couple of weekends I got out there and pulled every single weed, making sure there were no roots left in the soil. This may seem counter intuitive when much of it will be dug up anyway, but I believe starting with a clean slate is the way to go. 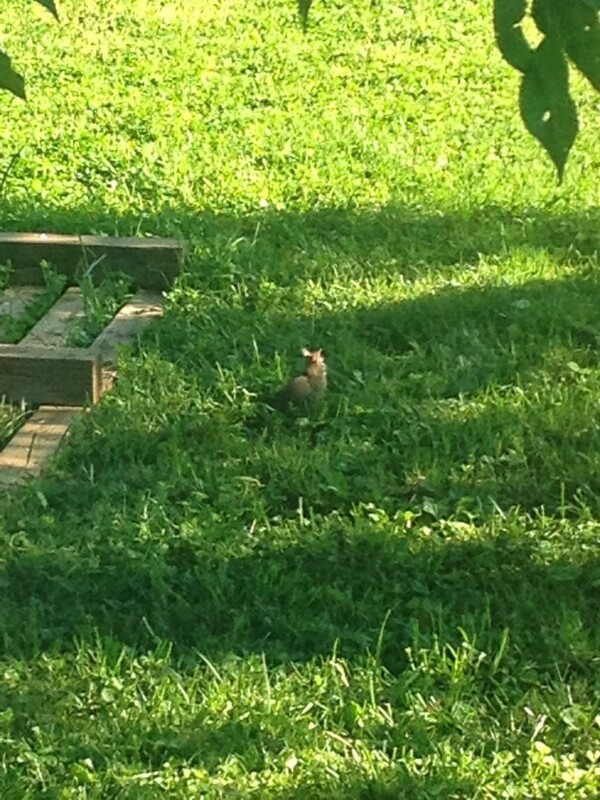 Robins were scurrying back and forth on the soil near where I was weeding, having the time of their lives, snatching up the worms that came to the surface. Occasionally the bird would abruptly stop, tilt it’s head toward the ground, and peck victoriously at a substantially juicy one. I love seeing worms in the garden, a sure sign the soil is in good health. 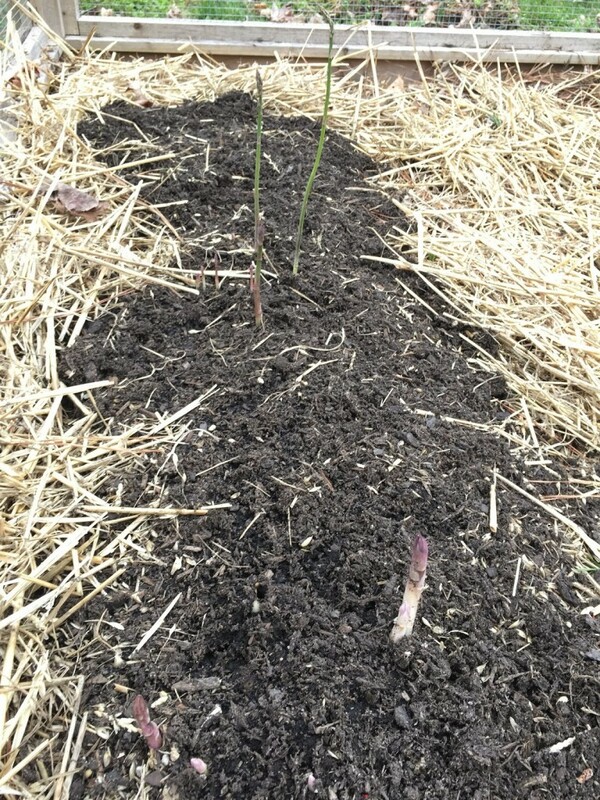 A very exciting development is that the asparagus is starting to peek out of the ground! Once everything was weeded, I went over the beds with a rake to break up the soil and ready it for a good sprinkling of lime. The lime acts as a neutralizer since most vegetable plants prefer growing conditions that tend toward alkaline. After that, I added 25 bags of compost with manure. I’ve done this every year since I started the garden and I believe it’s the way to go. 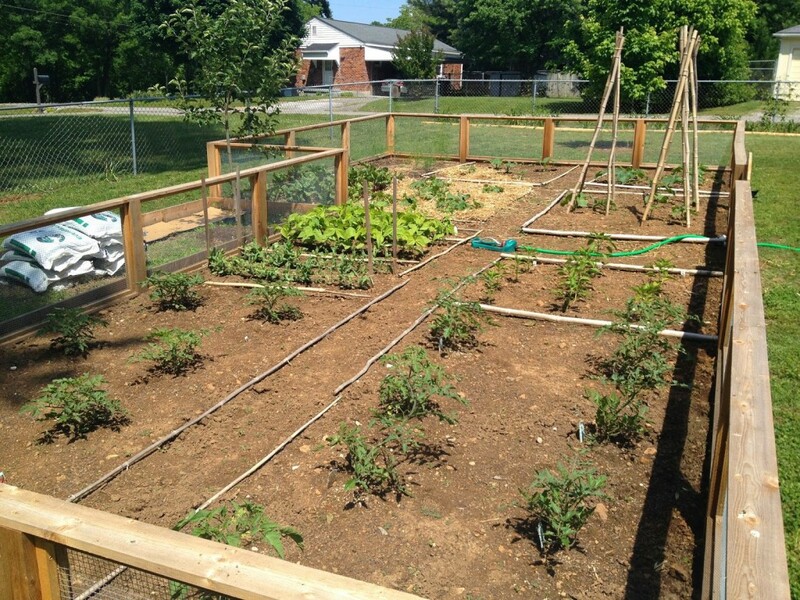 Since the soil here in TN is clay, just adding compost will only aid in texture, but not necessarily nutrients. I’m not a huge fan of synthetic fertilizers and chemicals, so the manure is an excellent natural fertilizer. I also add coffee grounds, egg shells, and other organic matter throughout the season, which is especially beneficial for the tomatoes which need calcium. This year for the first time I am not going to till. Last year I was overwhelmed by the amount of weeds. I absolutely could not keep them under control and I want to see if not tilling will help with weed control since old dormant seeds will not be brought to the surface. Also, this method of growing is supposed to help with water retention. Eventually, I’ll be buying a couple bales of straw to completely cover the soil before planting. This is a really effective way of keeping weeds at bay, retaining moisture, and adding nitrogen to the soil. The flower beds were cleaned of leaves and debris, and the perennial bed is ready to go. Spring bulbs are starting to pop up everywhere, which is a cheerful and lovely reminder that after the misery of winter, beauty shall prevail. 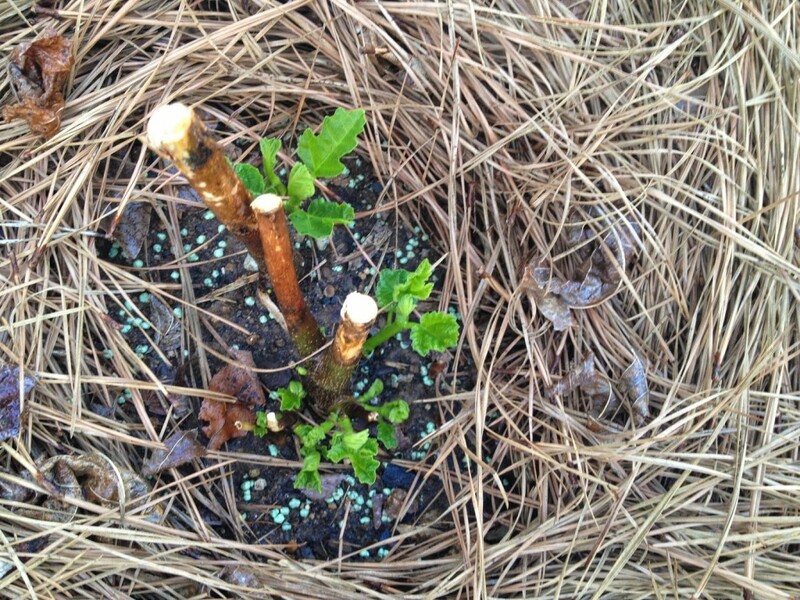 Pruning of all shrubs like holly, rose of sharon, heavenly bamboo, etc. 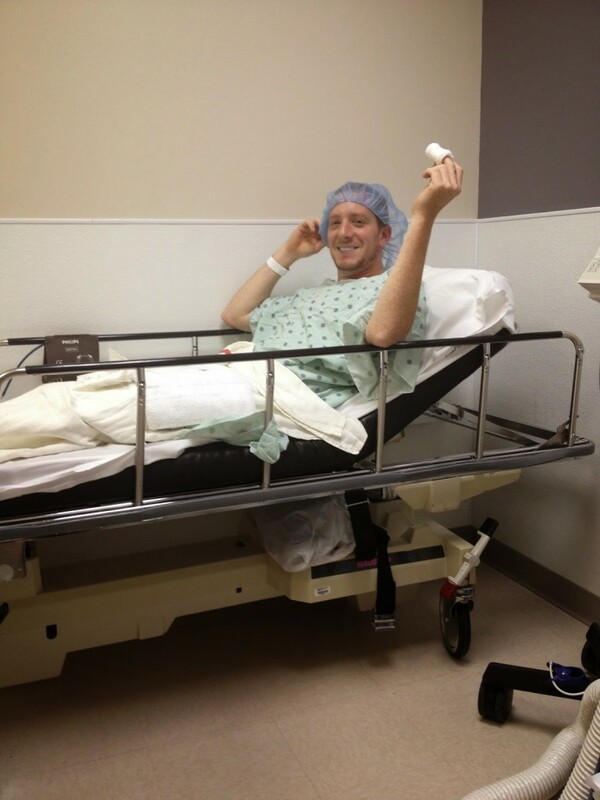 Now the patient waiting must last until mid-April when the magic happens! 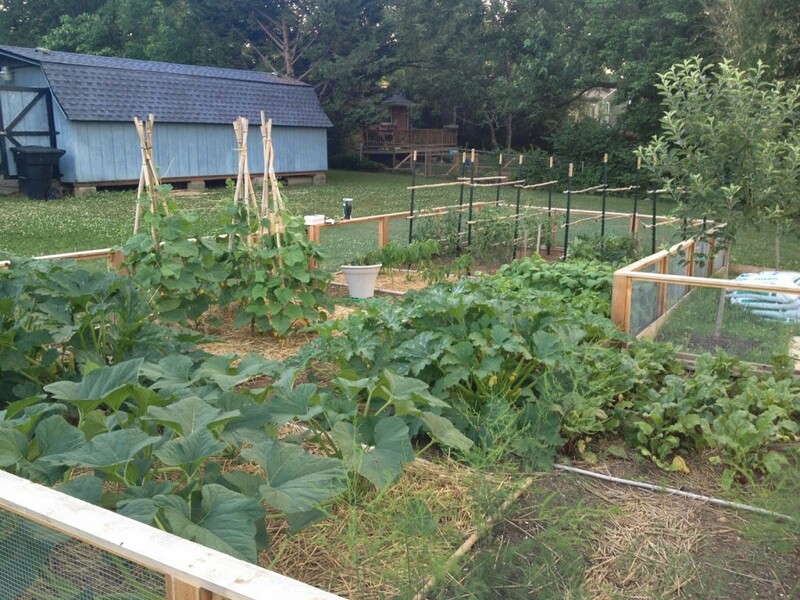 I’ve figured out that the cost of the vegetable garden is around $85 each year. Compared to paying for a local CSA, this is a steal. The estimate includes seeds, starter plants, and soil amendments. 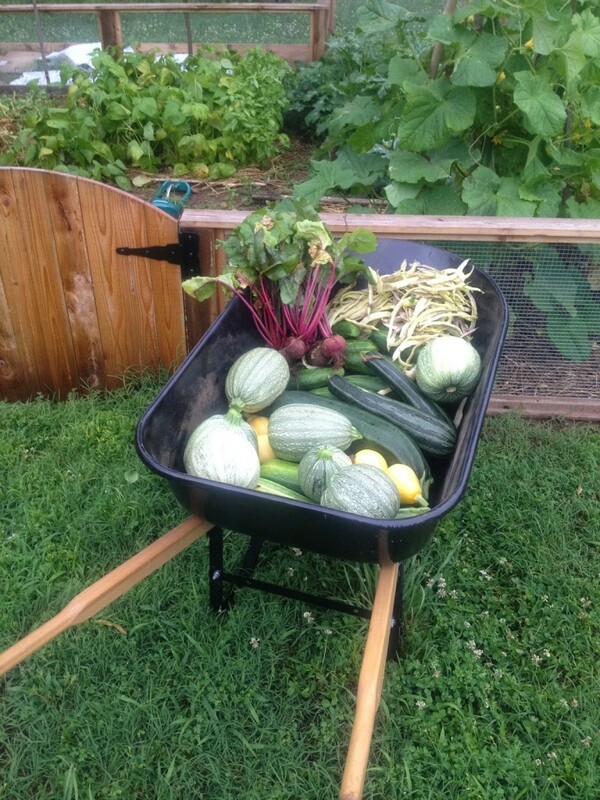 Obviously there is a lot of labor, plus water bill increases for the summer, but the payoff is tons of vegetables grown organically that we are able to eat year round. There are many times when I wish it was all easier and that I didn’t have such crazy back pain after a day in the yard, but I’m so thankful we have the ability to do this. Happy spring!!! The summer is always a busy time, but this year especially, the summer has been ramped up a little. 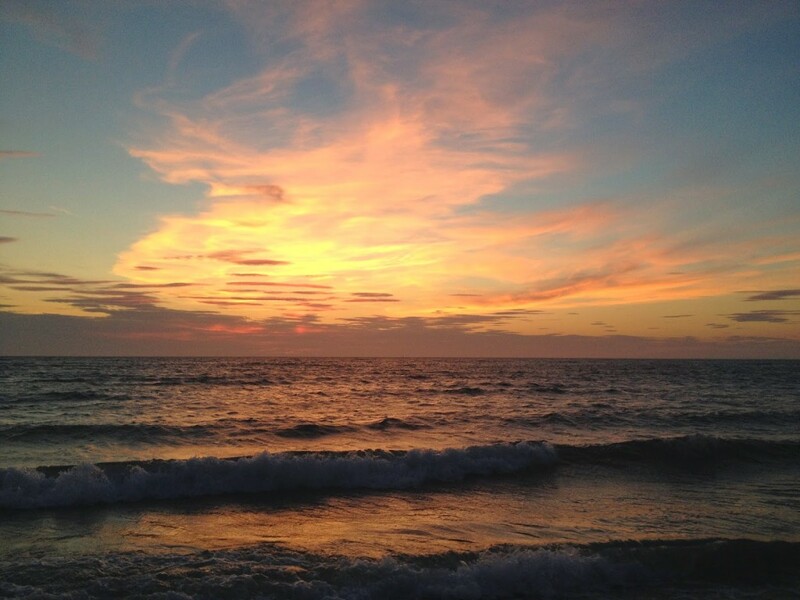 Three weeks from tonight I will be sitting in a restaurant overlooking the Long Island Sound with my best friends, my family, and Rob…eating, laughing, wondering what the next day will bring. Three weeks from tomorrow I will marry this guy I’ve grown to love so much I want to stick with him forever. That is CRAZY! People keep asking me if I’m nervous or stressed. I’m really not. I mean, I worry about a vendor just not showing up, or my dress falling off, or a category 12 hurricane hitting Long Island that weekend…there are so many things that can go wrong…but no, I’m not nervous yet. Standing in front of all those people might freak us both out a little bit, but we love each and every one of them and are very excited to share this time with everyone at home. 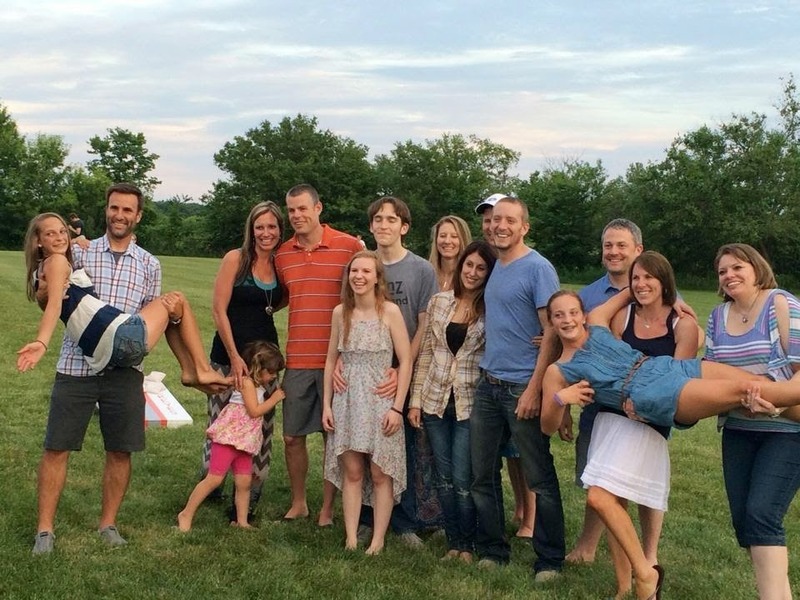 Rob and I went to Indiana for his cousin’s graduation party and I met my new family. Some of the coolest, sweetest, nerdiest, most awesome people. Seriously, how did I get so lucky?! 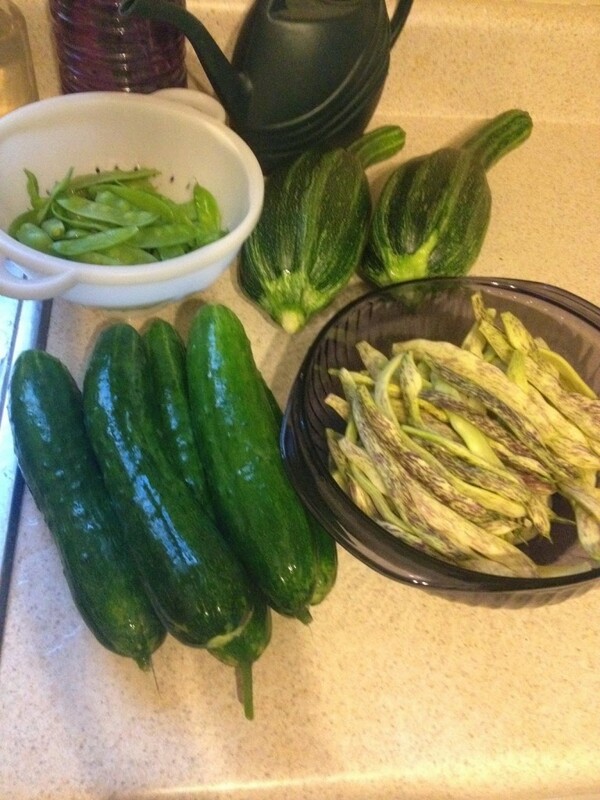 All this goodness came out of the garden! It has been an awesome year for harvest and we have eaten like absolute pigs. There are three other women in my office who I work with everyday. They make my job awesome. We laugh and have so much fun. The girls surprised the heck out of me when they brought in flowers, donuts, and got KATY PERRY tickets as a pre-wedding night out. Oh my gosh, was it fun!! 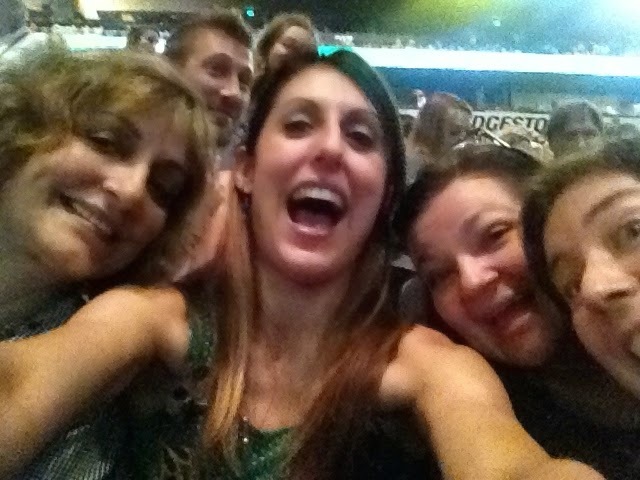 Here’s a blurry selfie of the girls who rocked my world that night. They’re all coming to the wedding. I could not be more blessed to have such amazing women to hang with everyday…and yeah, we get work done too. By default, I acquired a dog. I am not a dog person, but as dogs go, she’s really sweet and hasn’t tried to eat the cats, just their food. Her name is Lacy. She is the apple of Rob’s eye. 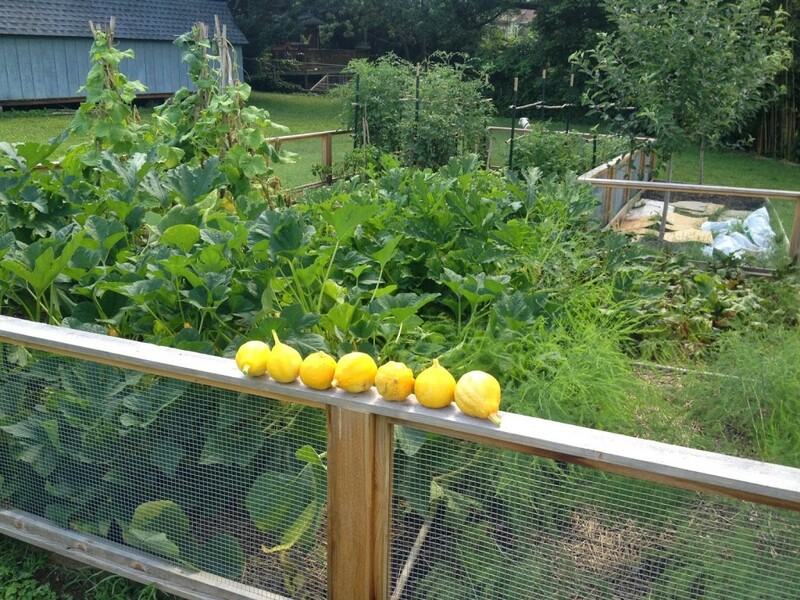 We ate a lot of squash this summer. 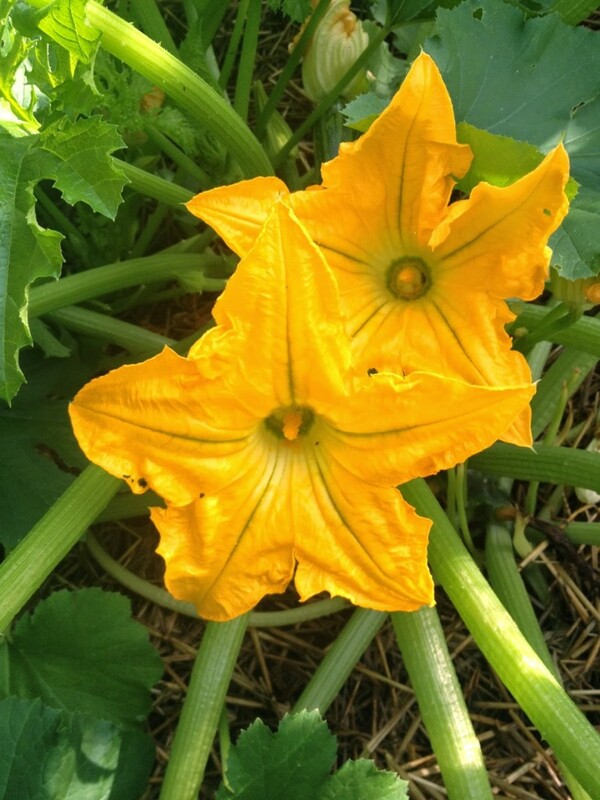 One of our favorite varieties is lemon squash. As you can see, the garden went totally wild (in a good way) and we could barely keep up with it all! I finished painting the pantry. It was ugly brown paneling and now it’s white. 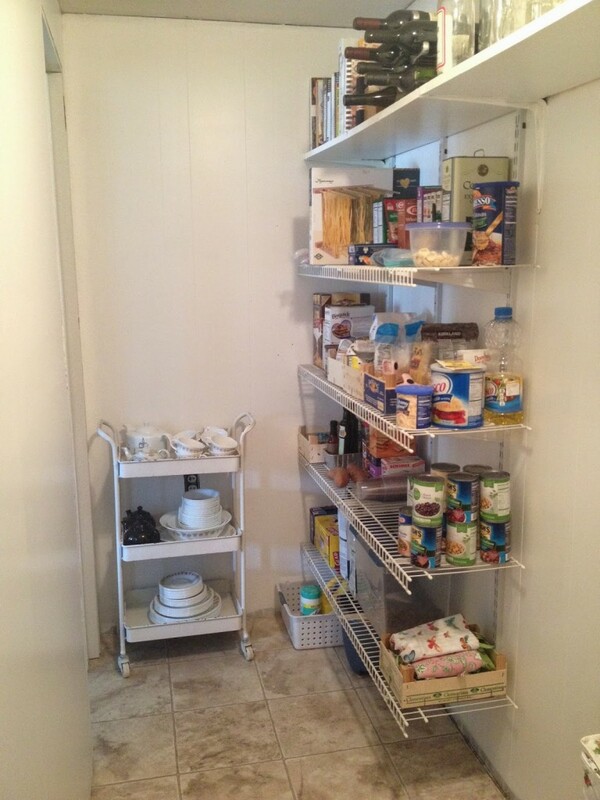 I know it’s not a Martha Stewart rad pantry like some people have…I mean, I live in a 60s house, folks…but it’s much brighter and cheerier now! 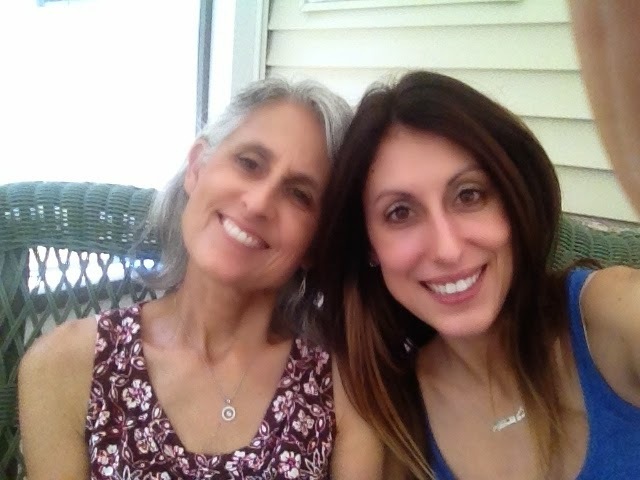 I hung with my little mom before my bridal shower at home. 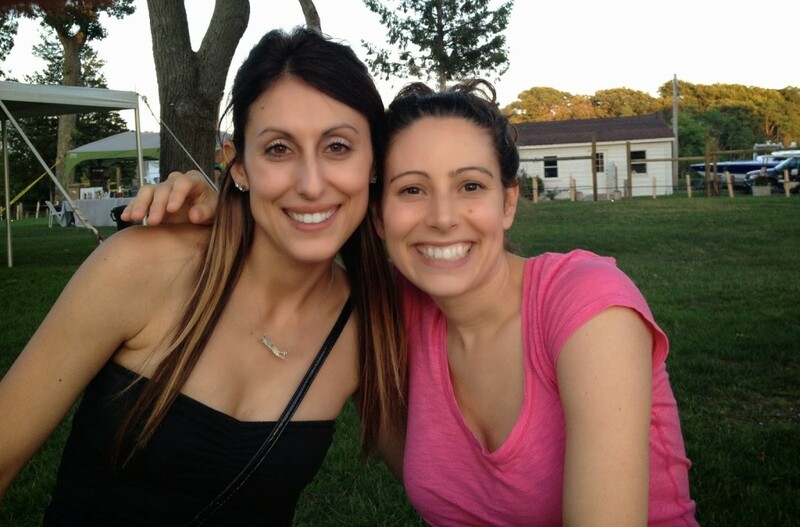 It was a humid day…the fog makes us glow and smooths out fine lines, no? Some of the most loved ladies in my life came to spend the afternoon, along with my best friend/maid of honor. It was perfect. No stupid games, just lovely conversation out in the screen porch, ungodly amounts of tiny quiches which I ate the next day, and CAKE. 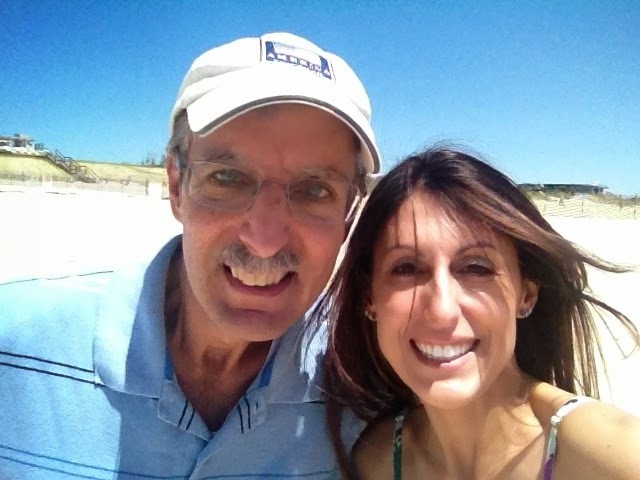 Took a selfie with dad in Bridgehampton at the beach on Ocean Road. Wind, sun, and perfectly crisp water. There is no use trying to have decent hair during the summer up there. My BFF, her hubby, and I walked to the marina down the street and heard live music on July 4th. I met her adorable new baby too! I was a bridesmaid in her wedding two years ago and she’ll be standing up there with me at the end of the month. Every moment we can steal at home is always precious! 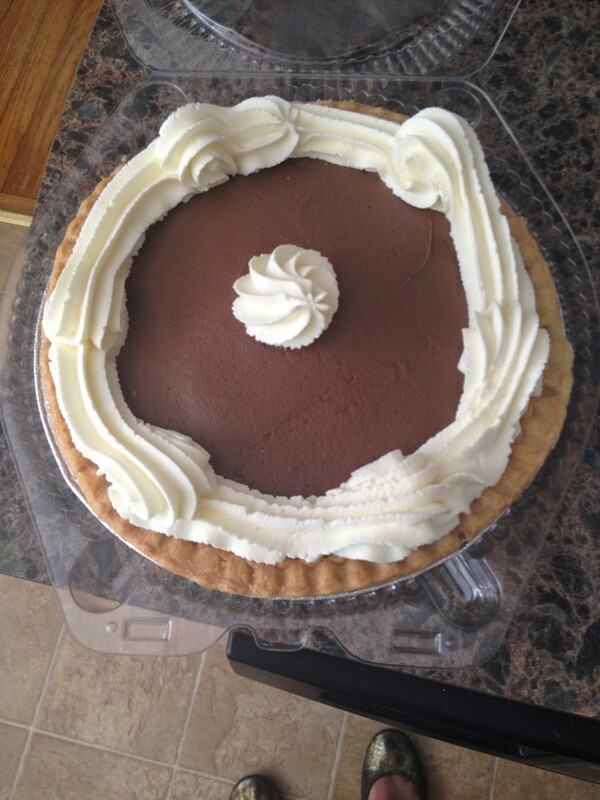 And ate this. 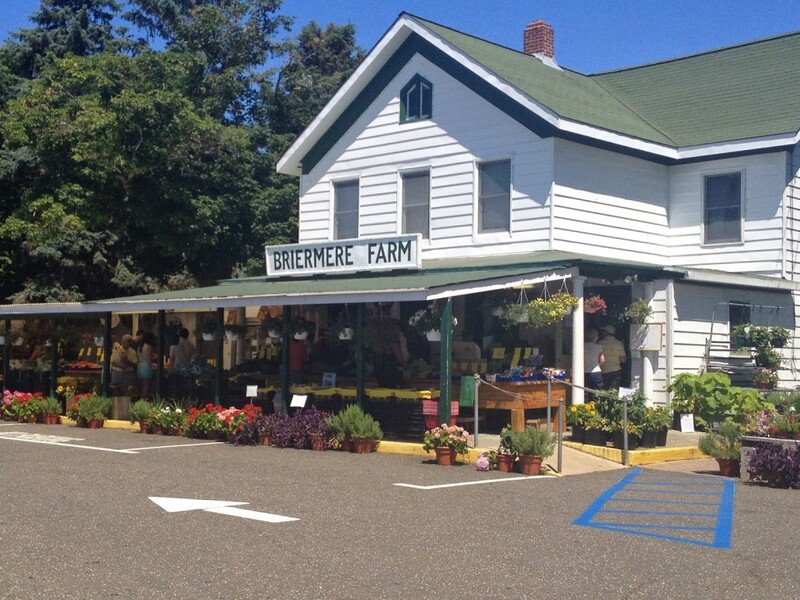 Chocolate cream pie and apple pie from Briermere’s will be served at the wedding. 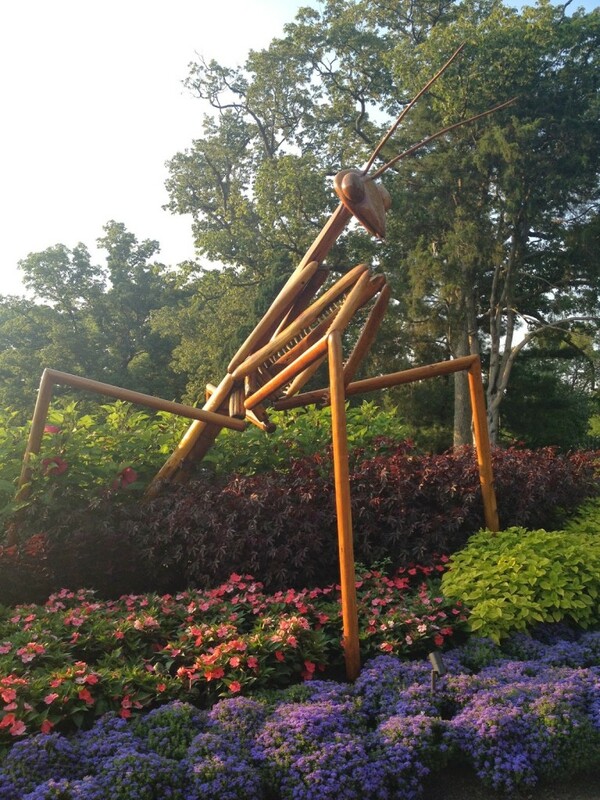 Cheekwood had an exhibit of big bugs. The praying mantis is my fave. 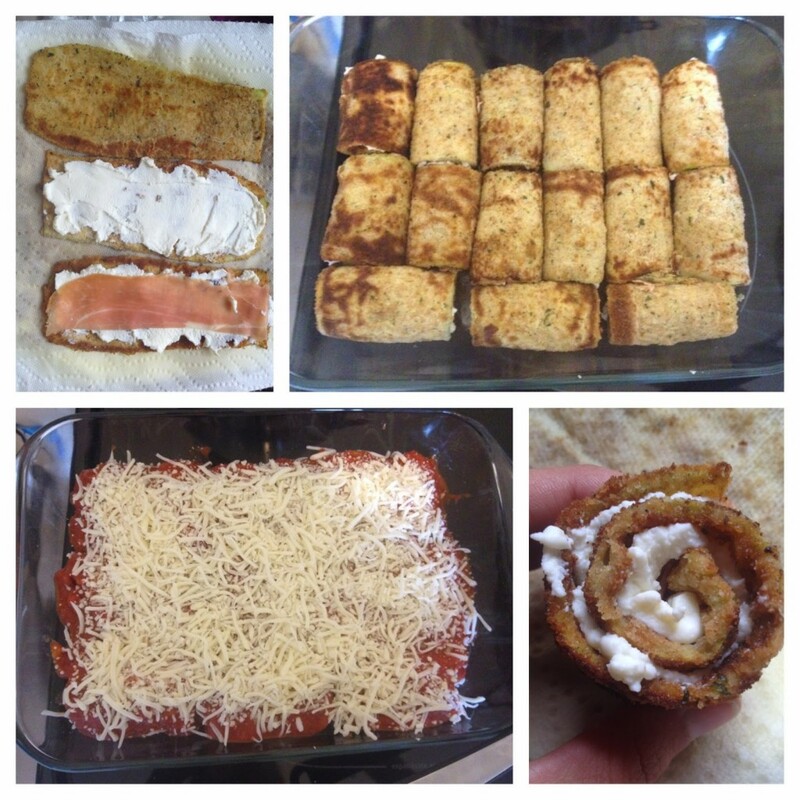 I’m not a fan of eggplant, so I made zucchini rollatini for the first time. It was delish and we’ll definitely make it again when the second round of zukes come in! 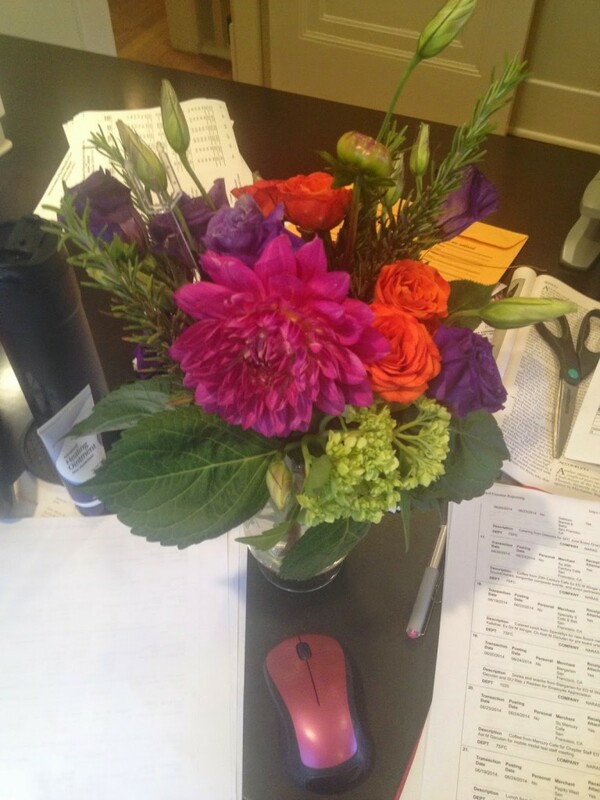 My BFF sent flowers when I was having a bad day and wanted to kill everyone. She remembered my favorite flower is lisianthus. I love her so much. Rob sold his house and we moved all his stuff over here. It was a huge decision and a lot to let go of. I don’t know how he did it in the time that he had, but it was a blessing how everything turned out. He didn’t even have to list the place. 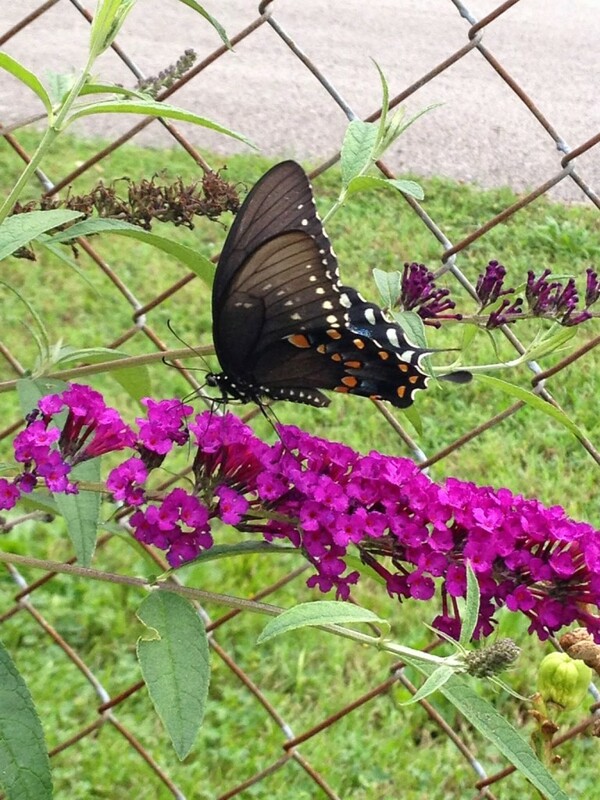 The butterfly bushes started blooming and I see eastern black swallowtails almost everyday now. They are magical. 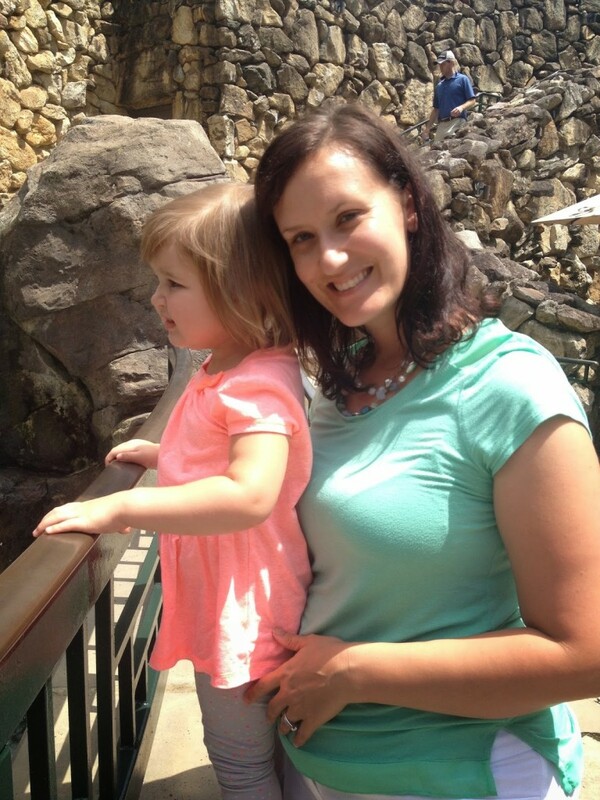 I met one of my favorite girlfriends in Asheville with her little daughter. 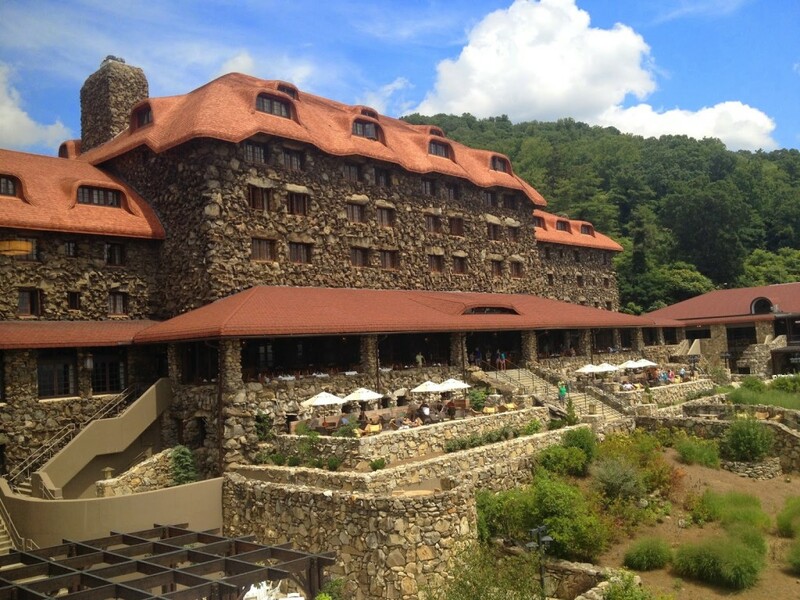 This is the third trip we’ve taken here and we always eat lunch at the Grove Park Inn on the Sunset Terrace overlooking the Blue Ridge Mountains. 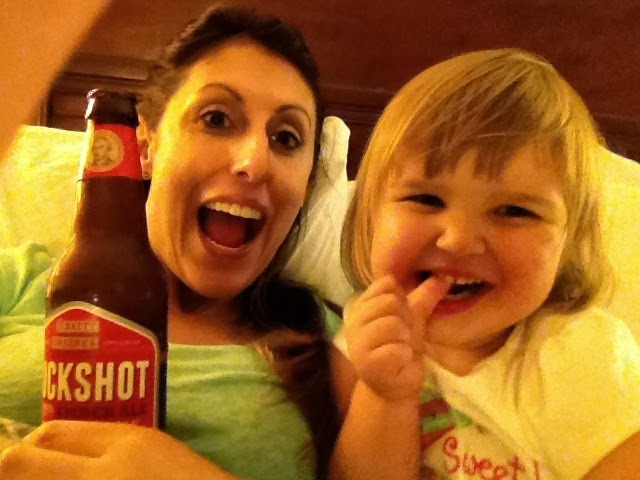 I’m pretty amazed by all my friends who are moms. All of them are superwomen. Dawn lost a few cosmetics on this trip thanks to a curious little munchkin who likes to squeeze tubes. This kiddo is a trooper though and hung out wherever we dragged her. 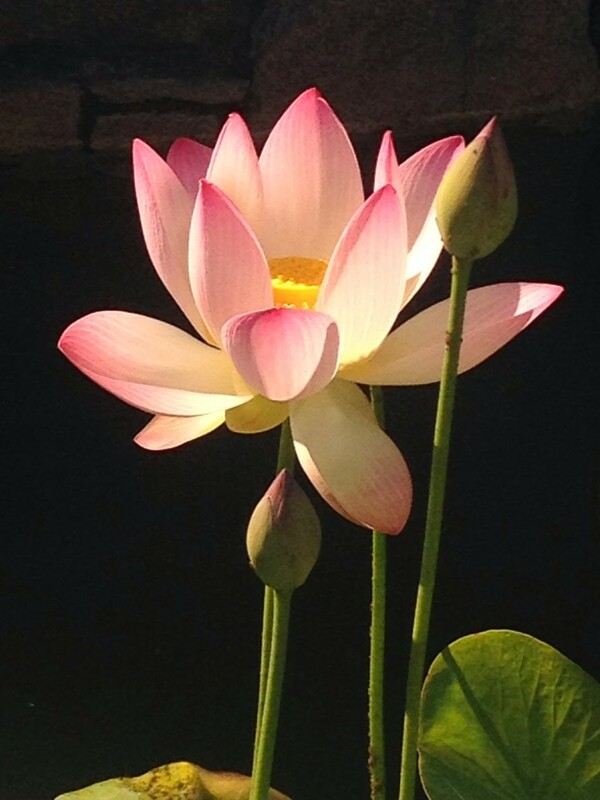 At the North Carolina Arboretum we saw this lotus flower in bloom. I think I had a spiritual moment just staring at this incredible plant. I get why people freak out over lotuses. It was breathtakingly perfect. 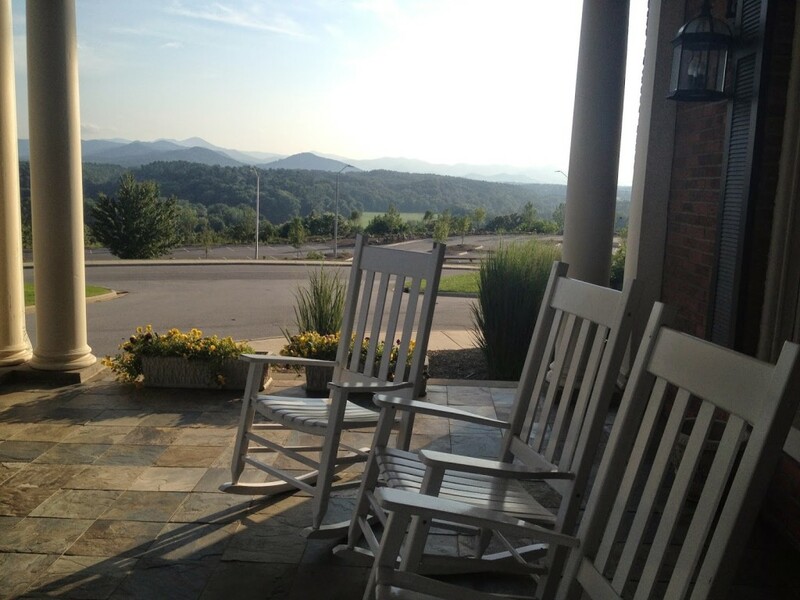 We sat in these chairs one evening and looked at the mountains. It was a very peaceful moment. Then we went back and drank because I can’t be around children for more than a few hours without copious amounts of alcohol. Obvs we are totes pals. 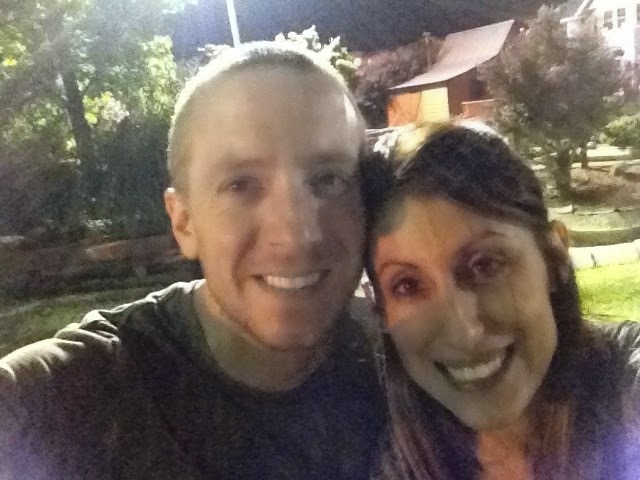 Rob and I had a much needed date night at the Grand Ole Golf putt putt place. He beat me on the two small courses, but I killed him on the challenge course. It was embarrassing. 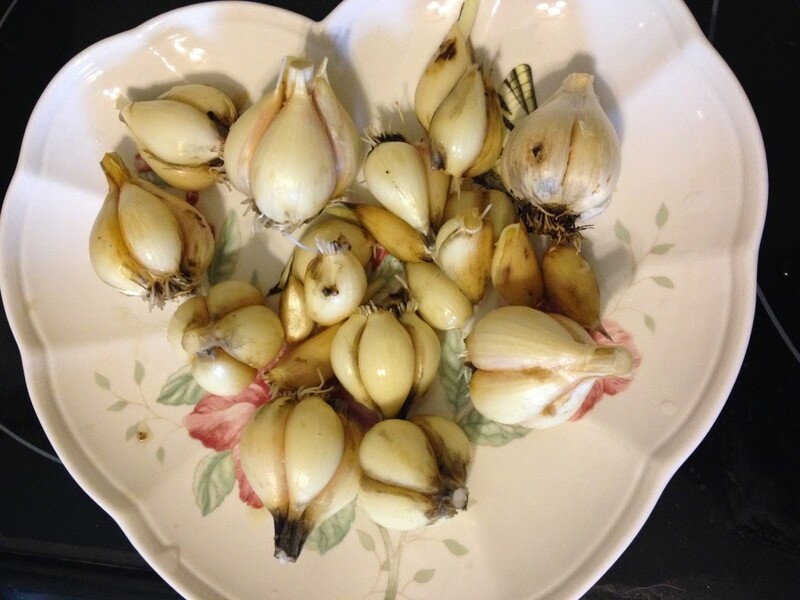 We finally harvested the garlic I planted last fall. I want to plant twice as much this year. 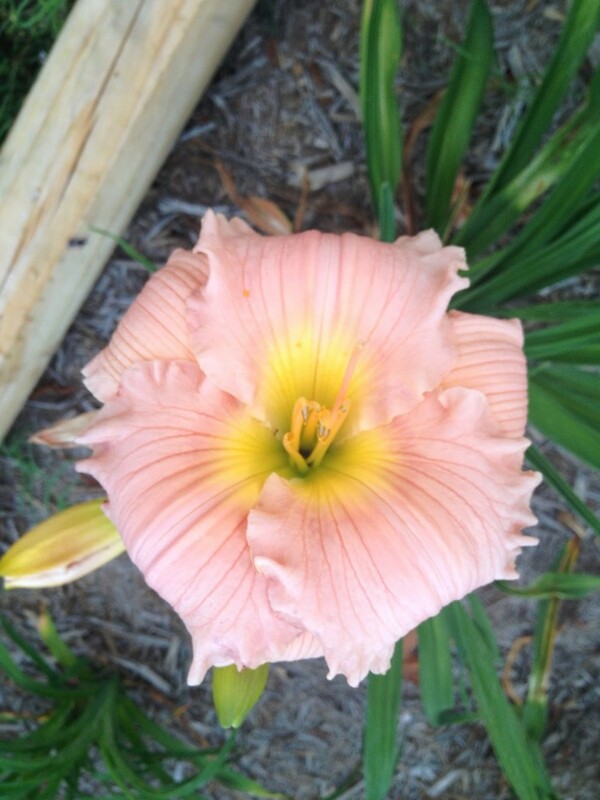 There is nothing more fabulous than pulling tiny, unimpressive bulbs out of the dirt and getting this. 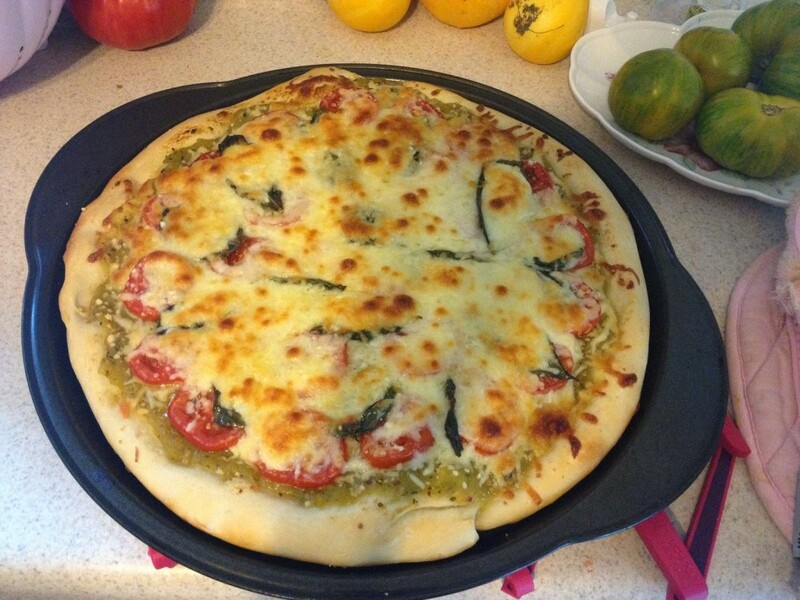 We made pizza with tomatoes and basil from the garden, pizza dough from Sal’s, and well…cheese. This was our first attempt and it was freaking awesome. 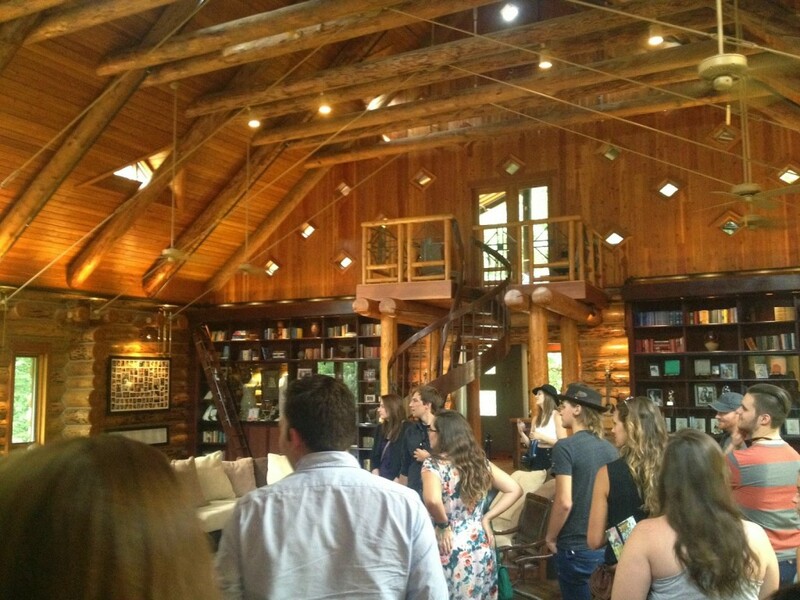 I stood in this room with a bunch of college students and Sara Barielles. She answered questions before her show at the Fontanel. I’m pretty sure we need to be friends. She is just very…authentic. Maybe that’s the word I’m looking for? I don’t know, but I really loved her. Her new album is on repeat. 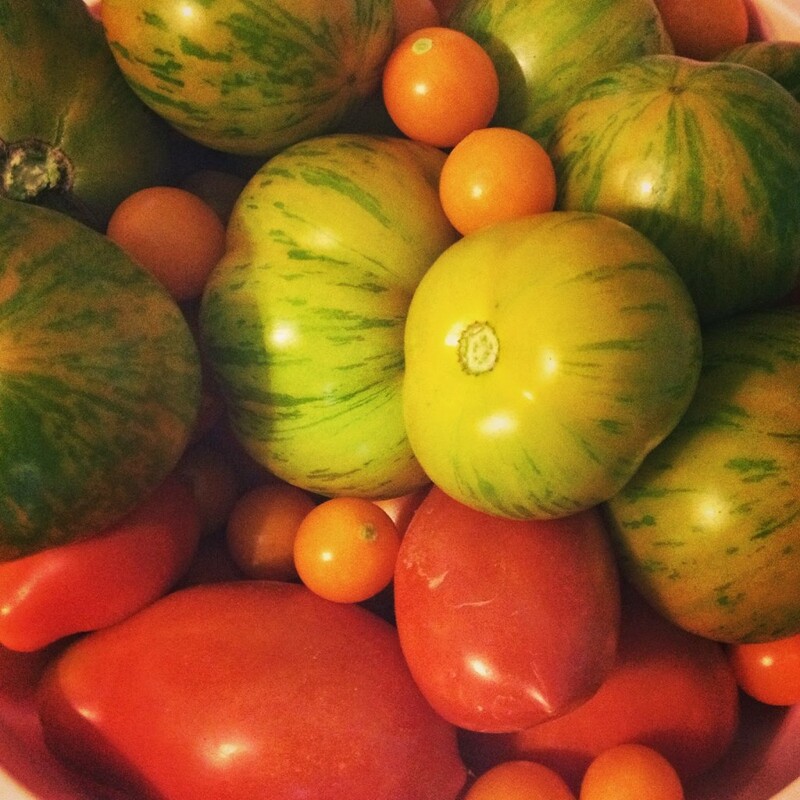 We have harvested insane amounts of tomatoes this year. I can’t even compare it to last year. I had the blight last year and thought I had a lot then, but this has just taken the proverbial cake. Last week I threw a ton into a dutch oven, baked them till the skins charred, then cooked them down on the stove for hours until the water evaporated. It made the most amazing puree ever. I’m in love. We’ll have enough sauce to last into next year for sure. The other day I was able to tour the new Acme building in downtown Nashville. I stood on the roof and looked back over Broadway, remembering how I felt about it when I saw it for the first time…not impressed. After growing up near New York City, it’s rather hard to compare. 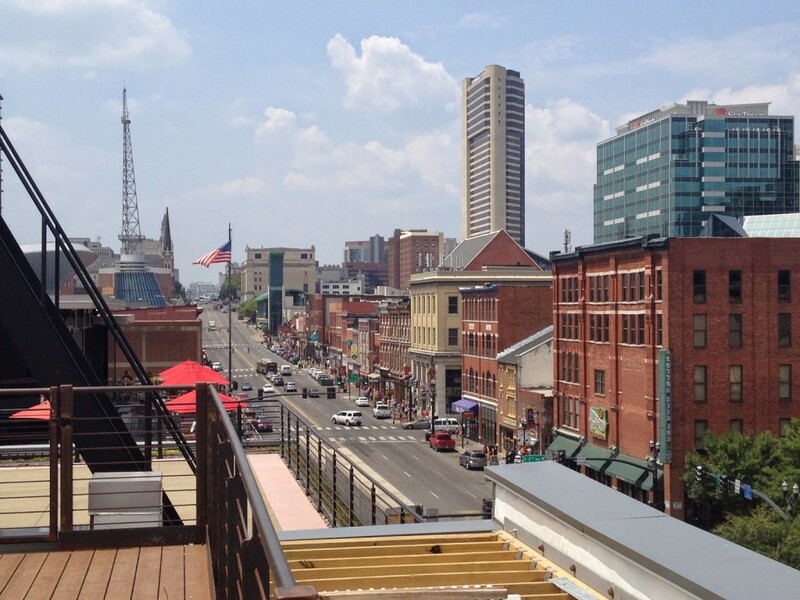 Nashville is evolving though by leaps and bounds with new restaurants and influxes of people. Broadway still looks much the same as it ever did, but things are a-changing. 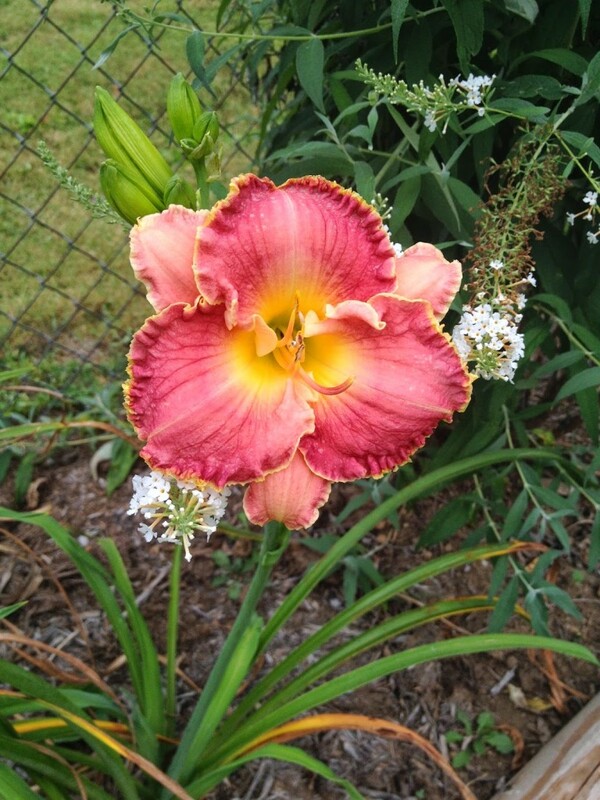 All of my daylilies are finished blooming. 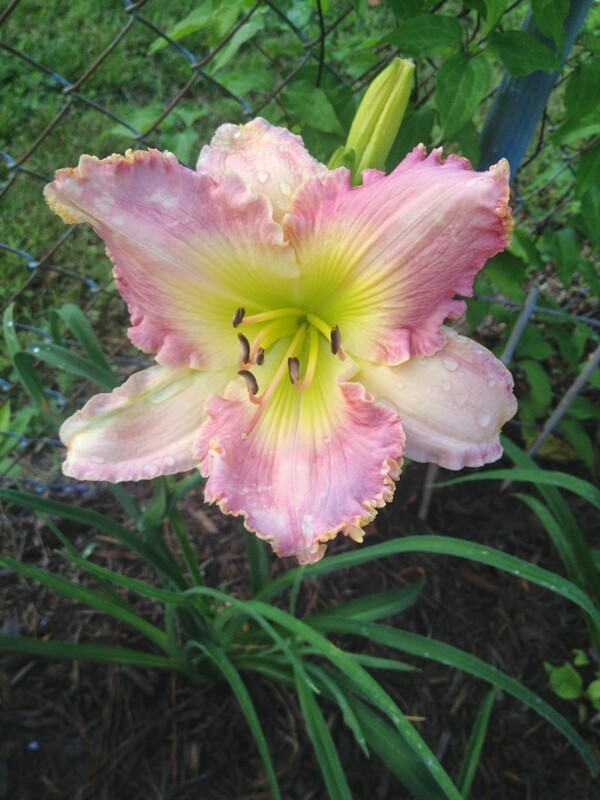 The dried brown stalks have been pulled off and new fall growth is beginning to appear, but today I walked out and there was this little beauty, just waiting to shine and hoping someone would notice. Every flower is a work of art and I am in awe of the garden, how it shifts and changes, painting a new scene everyday. There were more moments, more snatches of time to be thankful for, more walks downtown in the balmy summer evenings. My heart is full. I want to remember every moment over these next weeks and hold each one close. The past two and a half weeks have brought nothing but rain. Every day there has been some form of dreary precipitation that has nearly driven me mad with longing for sunshine. I mean, come on already! Although I’ve been saving money on water in terms of garden irrigation, too much of a good thing can really be a bummer. The squash are rotting right on the vine, the peppers look horrendous and have taken to falling over just to get attention, and the tomatoes are just not looking like themselves without some hot sunshine. In spite of this dismal downfall, the harvest is starting. One night in the lull between rainfalls, I got the tomatoes staked. Finally!!! 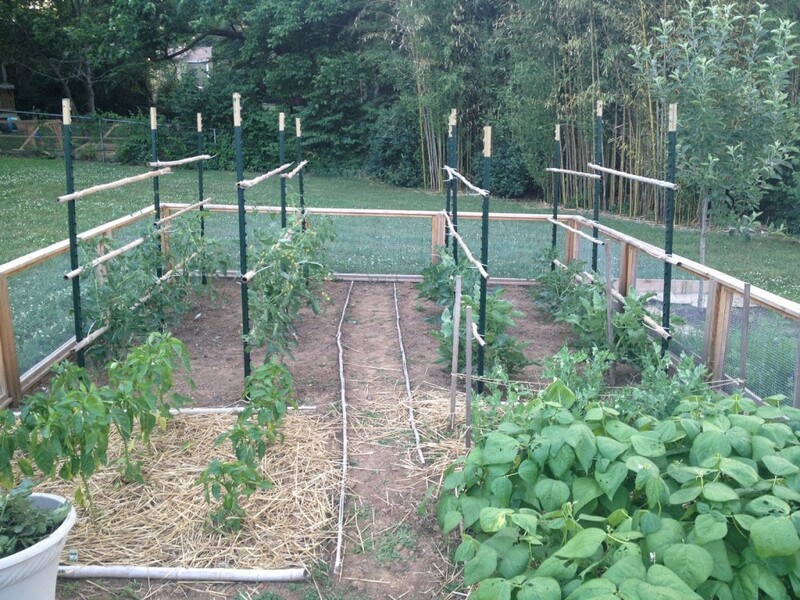 Rob pounded these stakes into the ground for me and I used zip ties to secure the bamboo to the stakes. The result is a much better system than what I had last year. There is airflow between the plants and room to walk in and harvest. 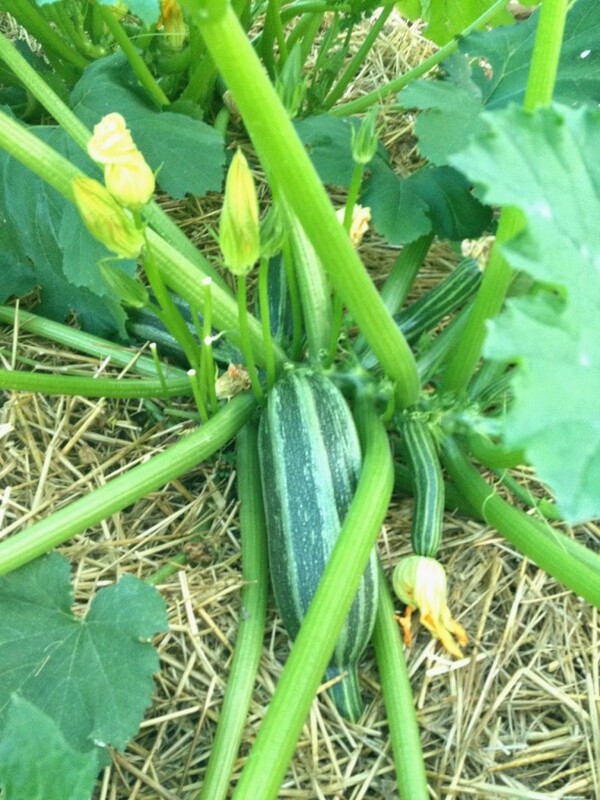 The squash plants have already grown to gargantuan proportions. Here is the romanesco. The taste is lovely, the flowers are gigantic and buttery, but I’m having rotting issues with these due to the rain. Here is what the garden looks like right now. 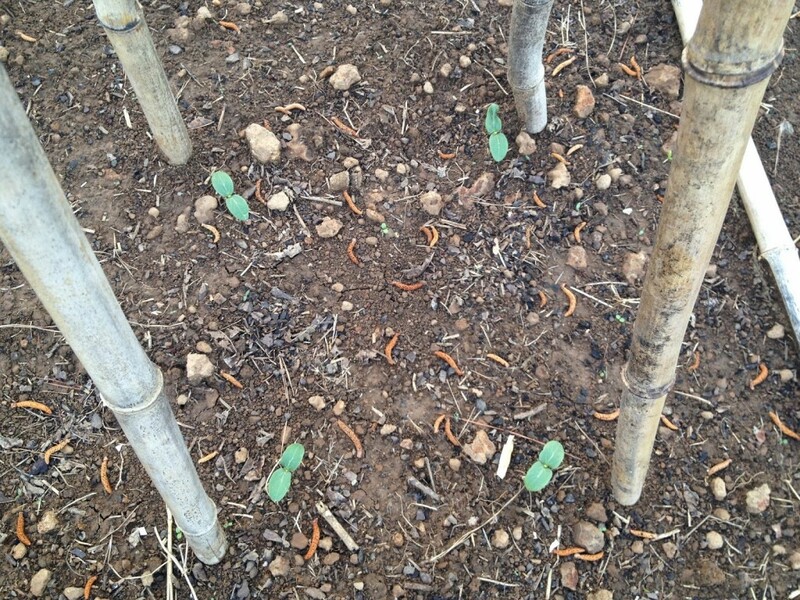 The cucumber vines are already taller than I am! Thank goodness for velcro ties. They are one of the most useful things I’ve purchased for the garden. I was able to reuse the ones from last year too! They don’t damage the plants and are really easy to secure. They cost more, but are definitely worth the investment! Tonight I harvested a bunch of goodies, so it was a bit of work when I got home. The great thing about the rain is that I can’t go outside in this nasty weather for days sometimes, so when I finally do, it’s like Christmas out there! These are dragon tongue beans. Aren’t they so pretty and purply?! I opted for these this year instead of green beans and I don’t think I can ever go back. The taste of these is fabulous! 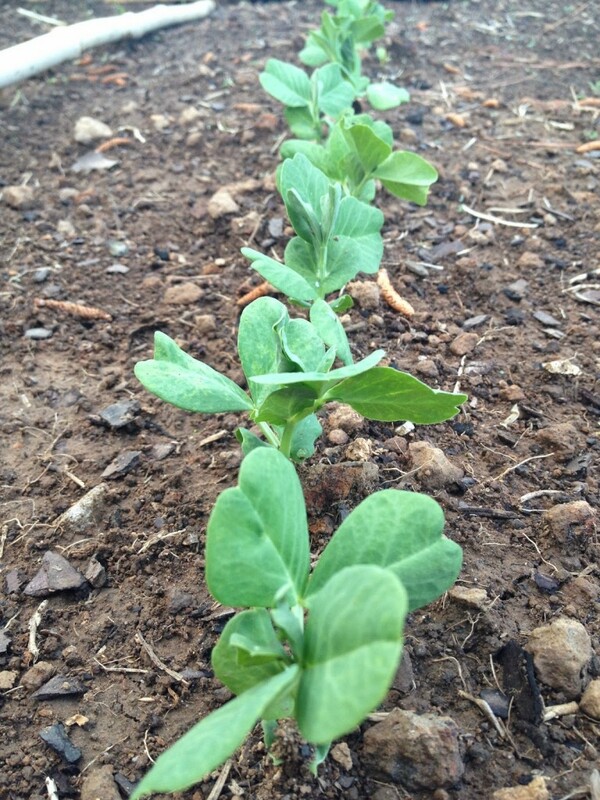 It’s much less grassy than a green bean straight off the plant. 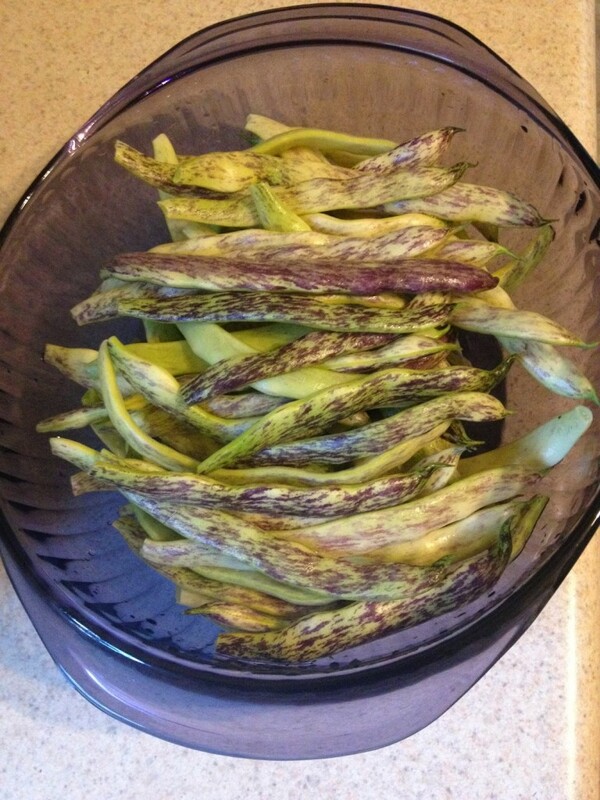 More like a wax bean, but sweeter…I am in love! 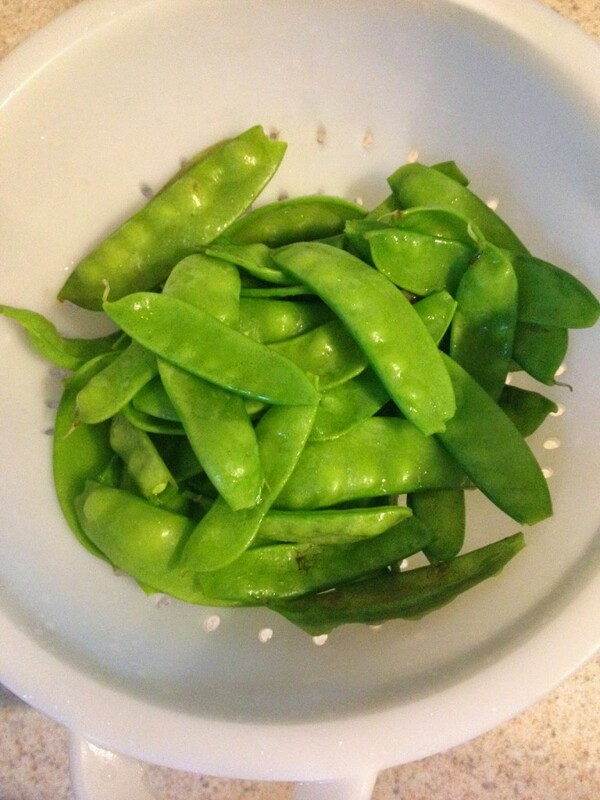 The snow peas look like a mess in the garden right now. Even though I strung some twine they had a mind of their own and look like a shipwreck. They have a lovely crunch though! 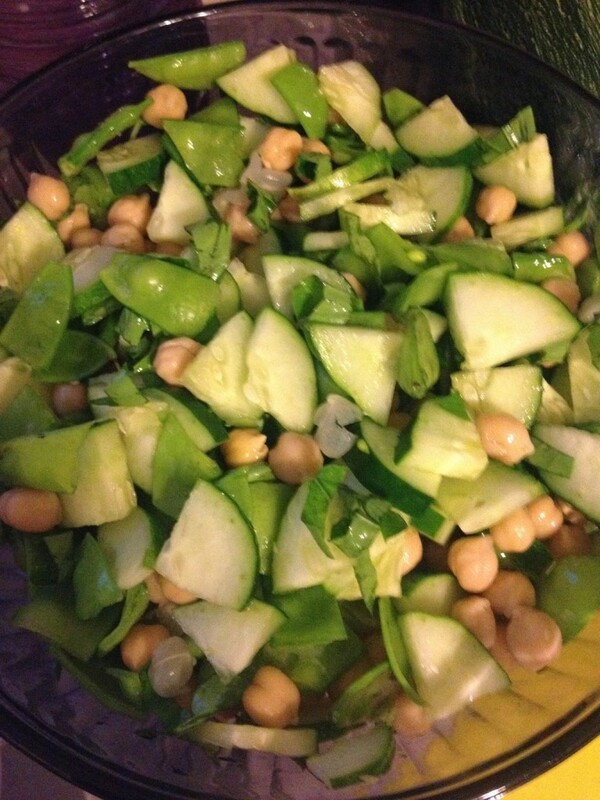 There is a lot of food right now, so I threw a salad together with cucumbers, snow peas, fresh basil, and chick peas. I’ll drown it in olive oil and balsamic vinegar tomorrow for a crunchy lunch because you only live once, right?! I’m sorry this picture is blurry. I think I had just dropped the phone in some water on the kitchen counter, or I couldn’t hold the phone steady from the wine I was drinking, not sure which. Oops! 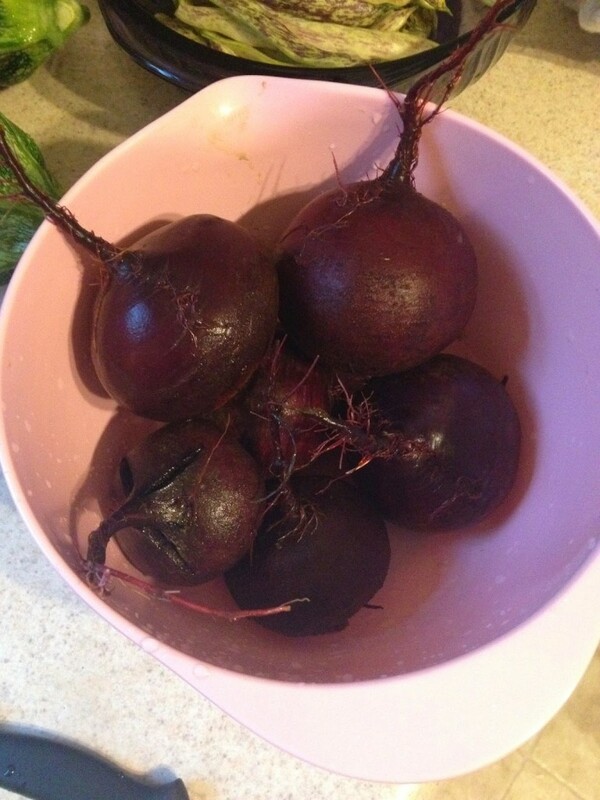 Beets!!! Ok, I know a lot of you probably hate beets. They have grown on me. I really like roasting them. I throw them in an oven safe glass pan, spray with olive oil, cover with foil, and roast on 350 for at least an hour until soft. Once they’re peeled and sliced, I love putting them on salad or eating them with goat cheese. Definitely prefer eating them warm as opposed to cold or pickled. Delish! 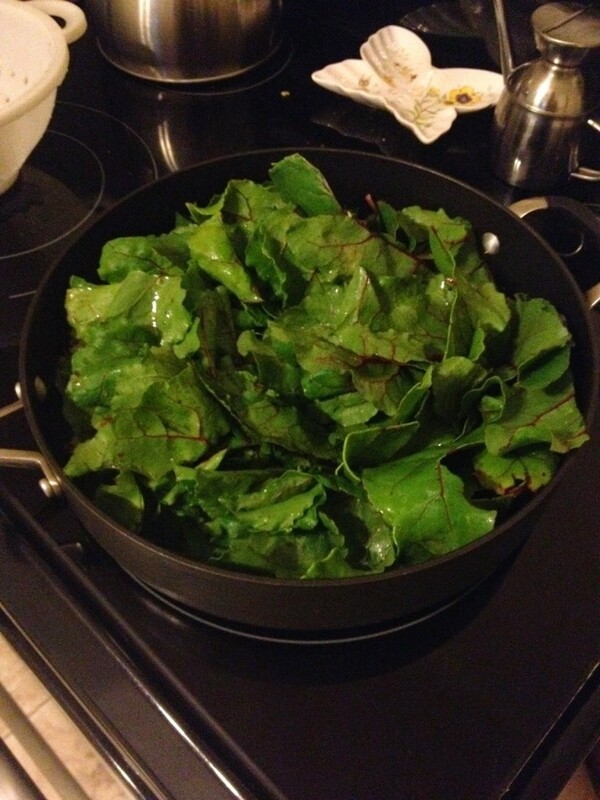 I am not a fan of beet greens, but I’ve found a way to cook them that makes them tolerable. I can’t stand to just throw them away! Dice half an onion and throw some crushed garlic cloves in a pan with olive oil, basil, pepper, salt, and red pepper flakes. 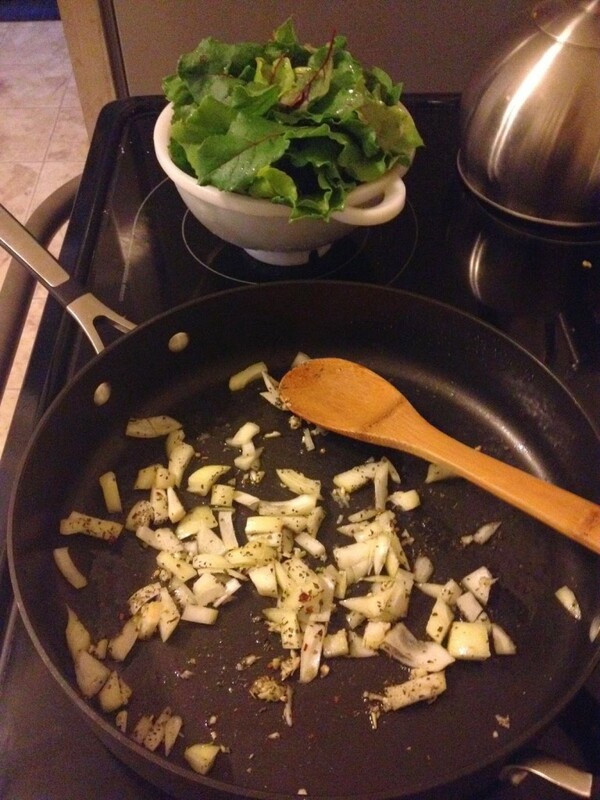 Throw the greens in the pan after the onions are clear and your house smells garlicky. 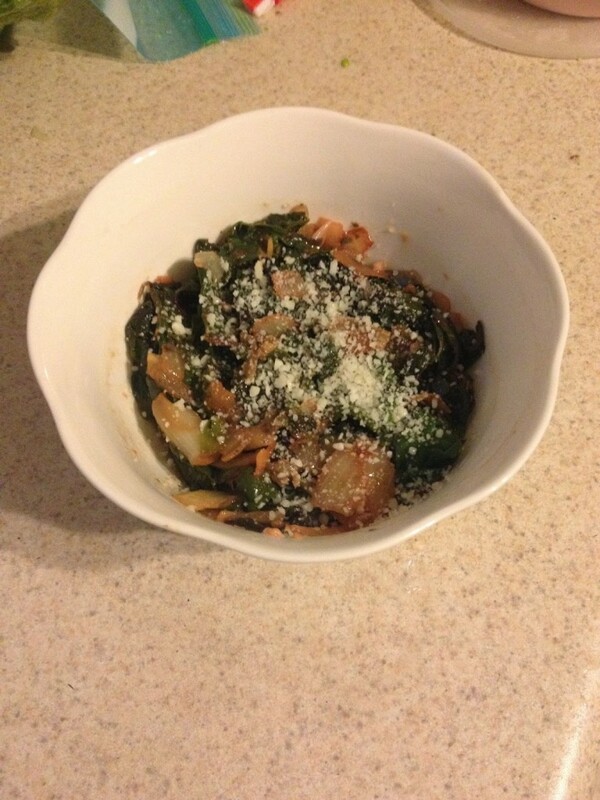 You’ll end up with a sort of mushy healthy bowl of greens. 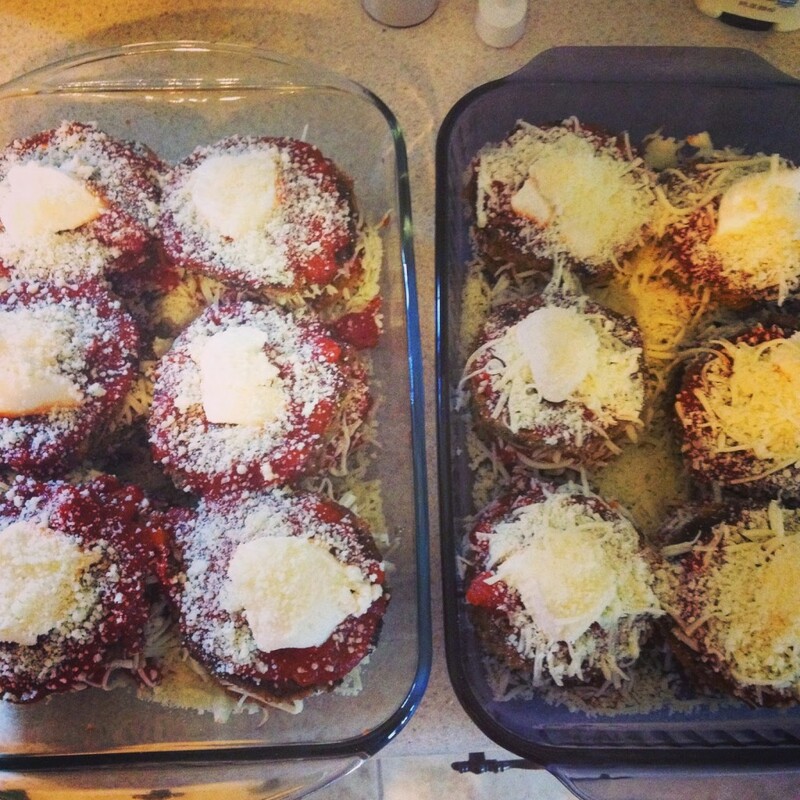 Throw some pecorino romano on there…throw on some more…you can never have too much Italian cheese, you just can’t. While I was slaving away in the kitchen like some 50s domestic goddess, this was happening. Ok, I’m back…other parts of the yard have benefited greatly from the rain. Look at this hideous thing the previous owners left for me when I moved in. 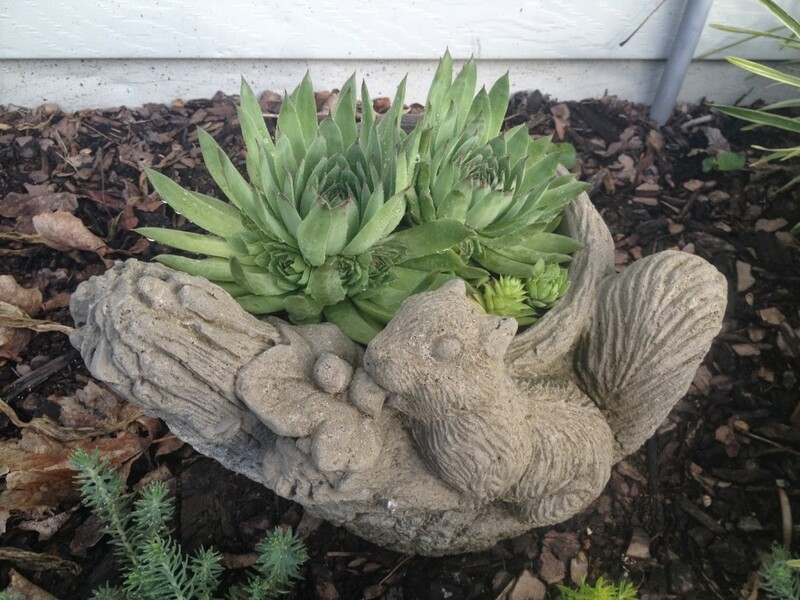 I was going to throw it away, but it’s a planter and plants can be stuck in those, so I stuck some hens & chicks in there and voila, it’s slightly less hideous, but honestly, you can’t really improve a concrete squirrel, can you? 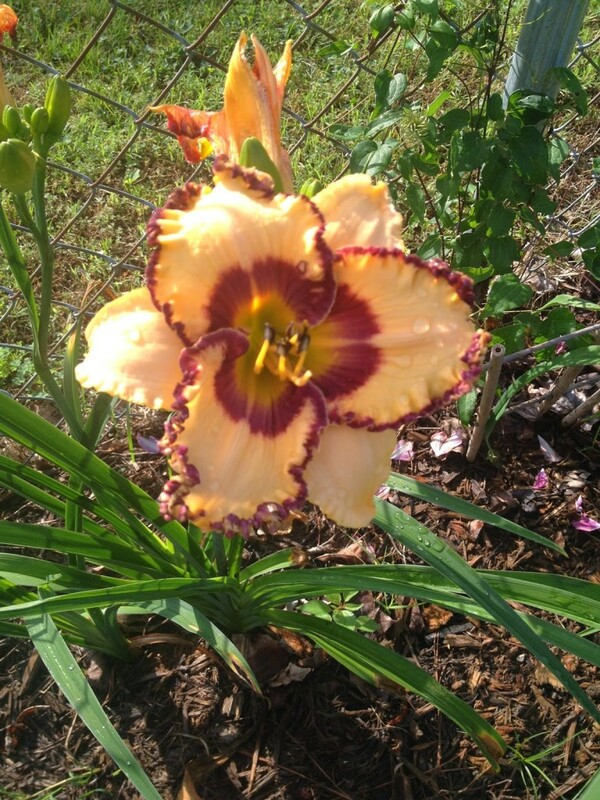 Dad’s daylilies are the crowning jewel of the garden right now. Last year he sent 60 plants down here of his own hybridized varieties. I tagged the plants when I was home and he dug them all out, boxed them up, and shipped them down here. Looking at these gorgeous flowers takes me home. Every year when I go home for July 4th, Dad’s garden is blooming wildly and it’s hard not to get lost in the loveliness of it. Now I have a piece of that here and I can’t describe how happy it makes me! 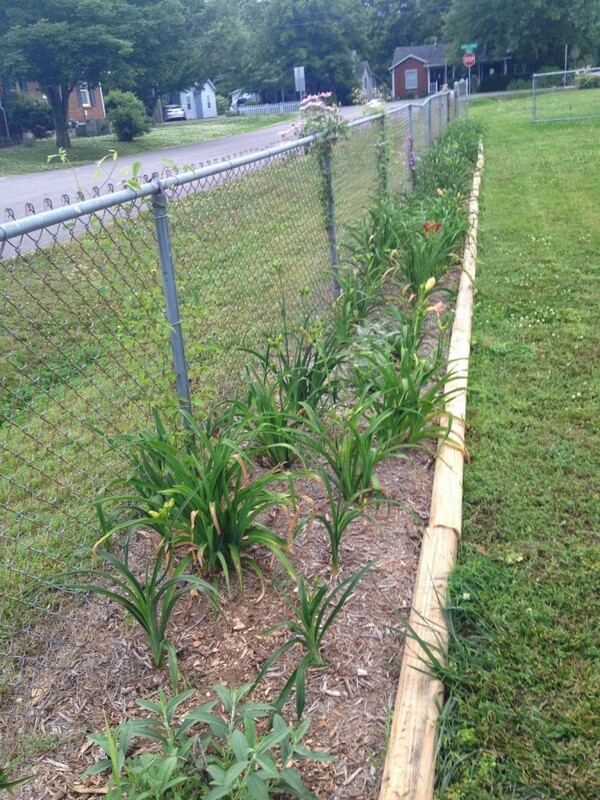 This is what the flower bed looked like just a couple weeks ago. It’s so interesting to see how things grow here. One year, something does really well and then this year, it’s failing. 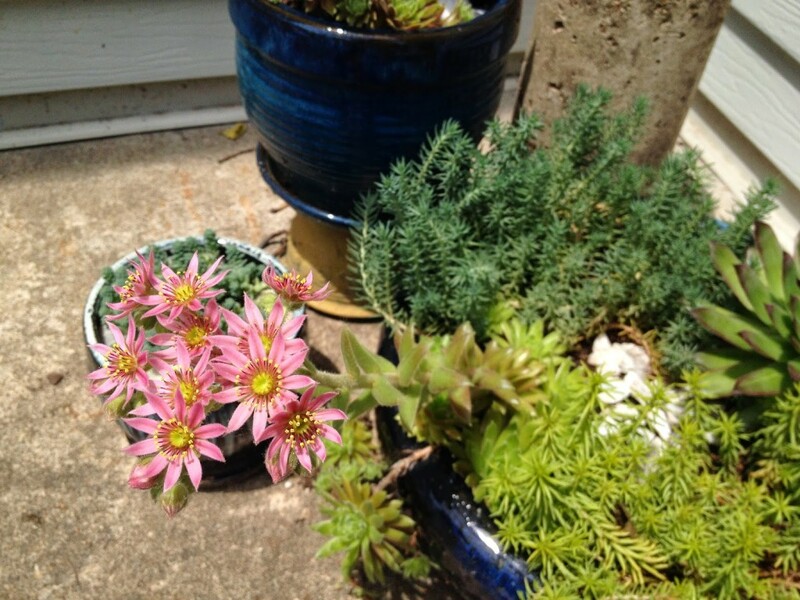 Or last year I couldn’t get flowers to grow in a bed and this year, plants are thriving. I can’t imagine not having the garden to come home to because something is always new, a season is always changing the landscape. The garden requires one to observe or beauty will be missed. 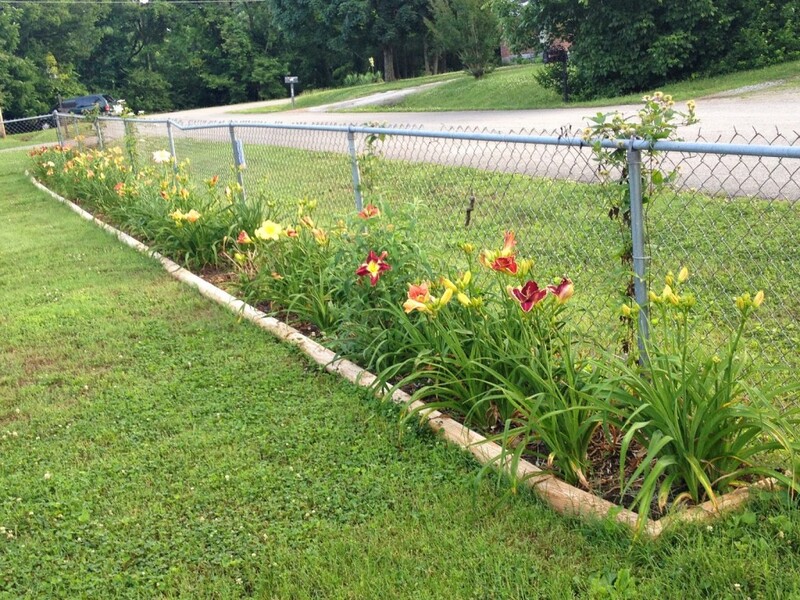 I walk along the side flower bed each day before I hop in the car and head to work. The fig is taller. The roses are blooming. The foxglove is falling over in the rain. 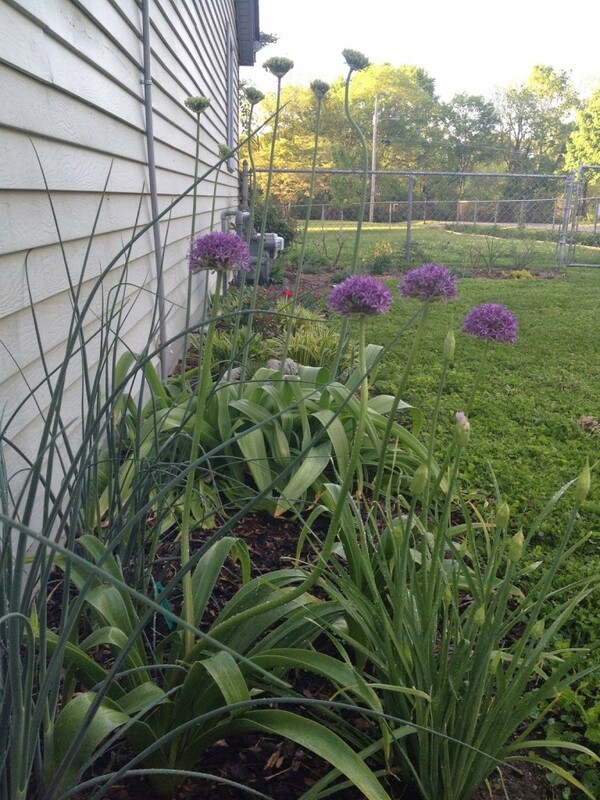 New alliums are turning purple. The lavender is finally coming back. The purple coneflower is starting to bloom. Butterflies will be here soon. Nothing stays the same and I’m reminded that this is a big year of change for me too. I’m getting married. I know that Rob and I will face our challenges as we try to figure out living life together after being independent for so long, but I hope that each of us provides a space where the other can grow and blossom. For now we will eat lots of fresh things and fill our stomachs and be reminded of how blessed we are. My goodness, it’s been a while, hasn’t it?! Well, things are happening here in the yard. While I haven’t had as much digging to do this year, the flower beds are still getting established and there is lots to keep track of. Let’s break it down into friendly, easy to read sections, shall we? 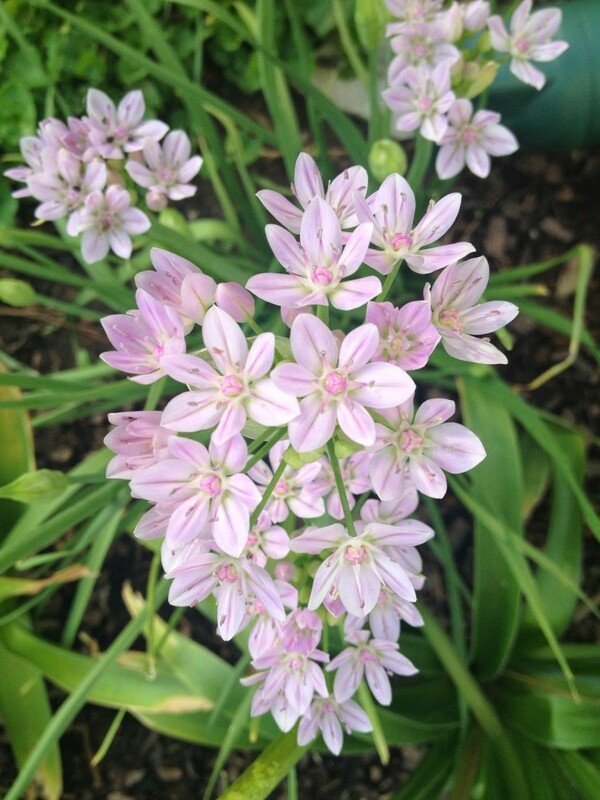 Let’s talk about onion flowers because these are some seriously cool things to grow. When I was a kid we always took trips to Vermont and I remember seeing these huge purple orbs in a lot of the gardens up there. They were otherworldly and really cool, so I got some for the garden. 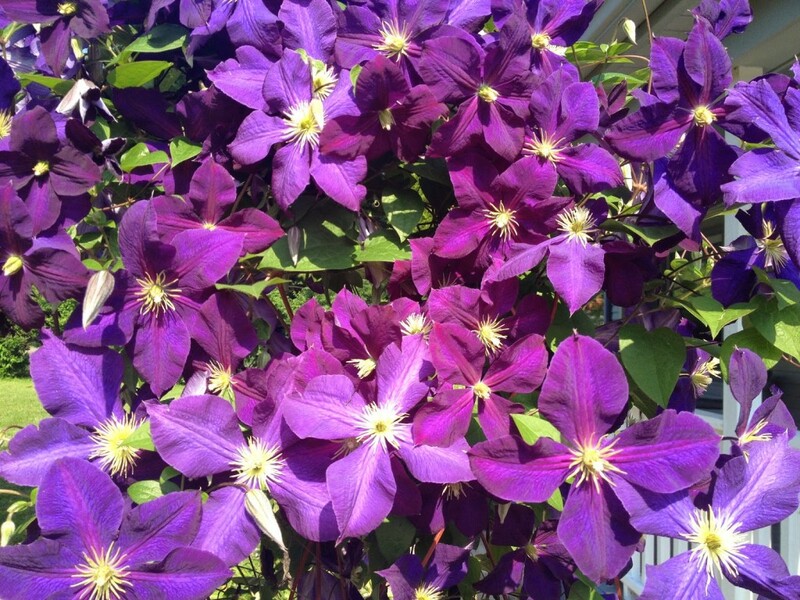 There are dozens of varieties and they are all deer resistant, pest resistant, and multiply every year. Several neighbors have stopped by to ask what those “purple flowers” are. 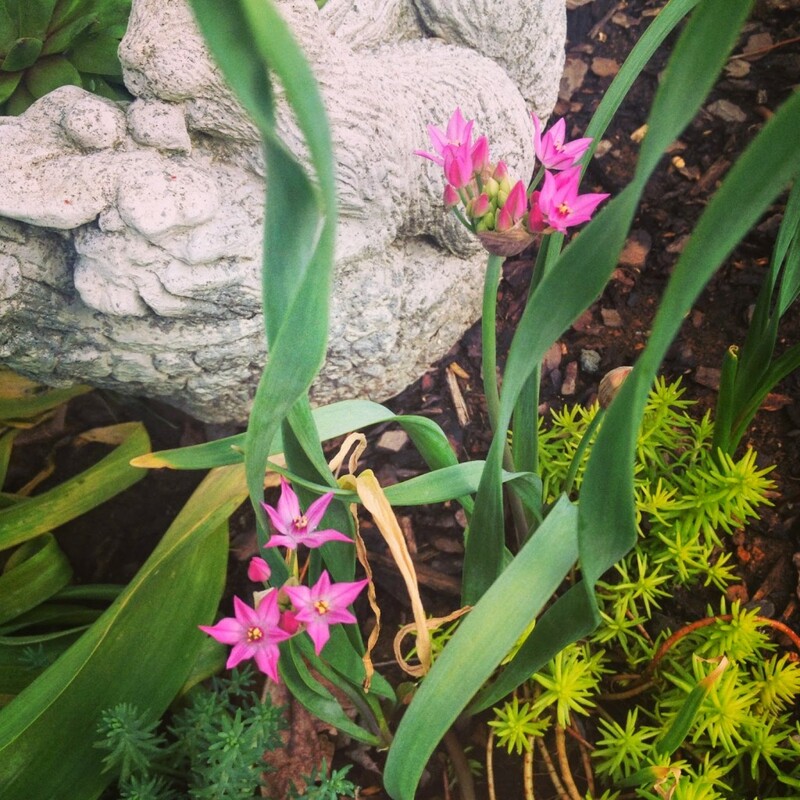 I give you allium. 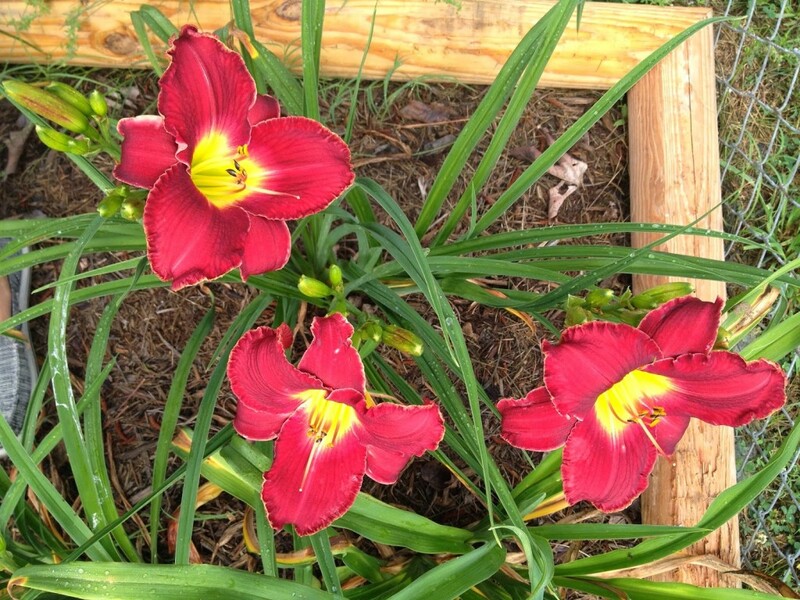 I ordered several varieties from Brent & Becky’s bulbs online and a few have yet to bloom. I’ll be sure to post more pics as they show up! 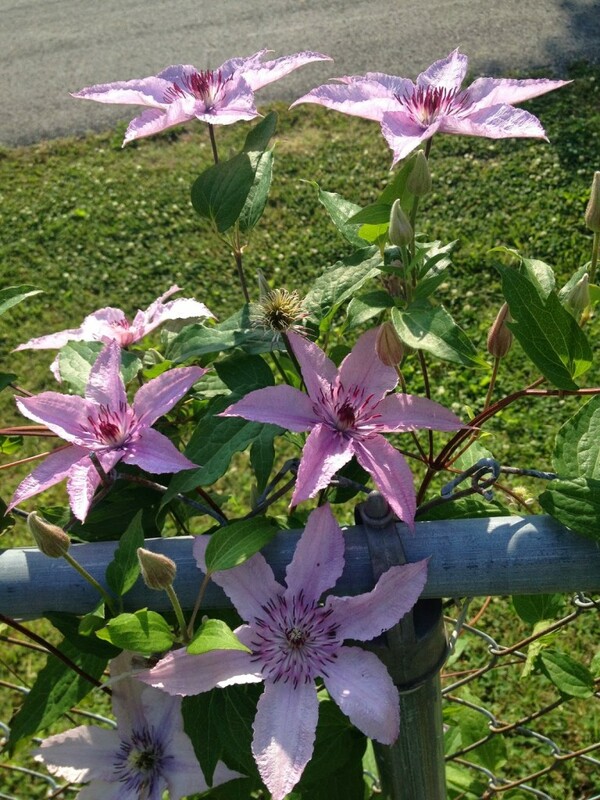 These climbers were the first flowers that came to mind when trying to figure out something that would grow on the fence and maybe spruce it up a bit. That thing really is so ugly. 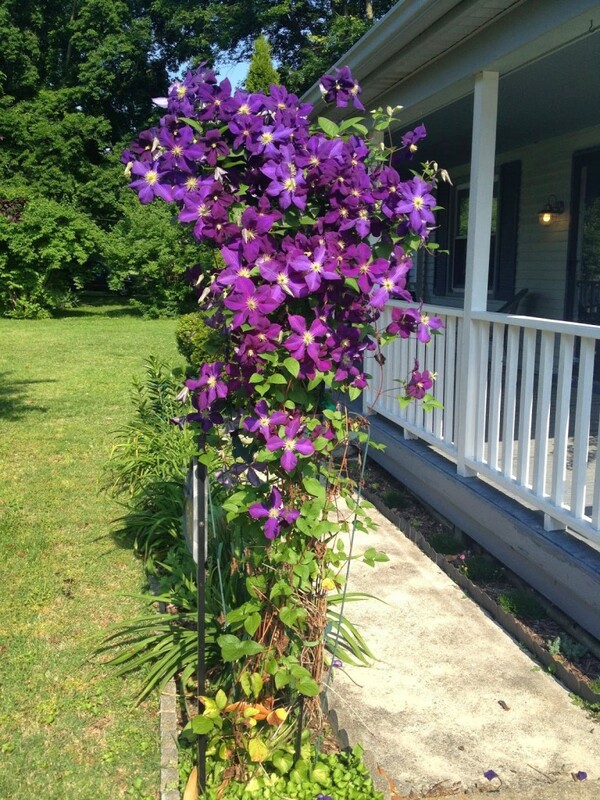 When I moved into the house, there was an enormous purple clematis by the front walk that has obviously been there since the beginning of time. 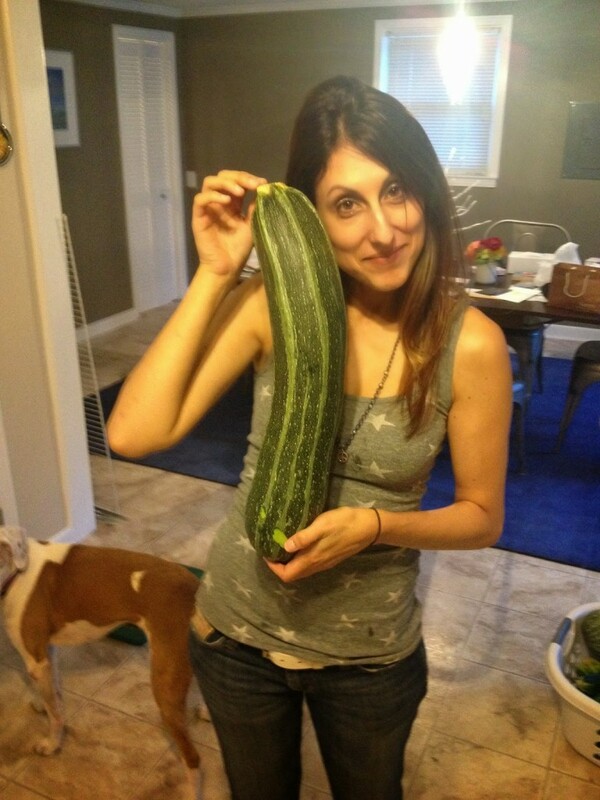 This year I hacked the woody stems back to 12 inches and it is now taller than me. I am convinced this plant is going to strangle me one day while I’m walking to the car. I bought several varieties last year in a crazy sale when they were $5 apiece. Best $5 I’ve spent in a long time. Only one didn’t make it over the winter. They are already letting the fence know who’s boss. I have never in my life made a cactus bloom. 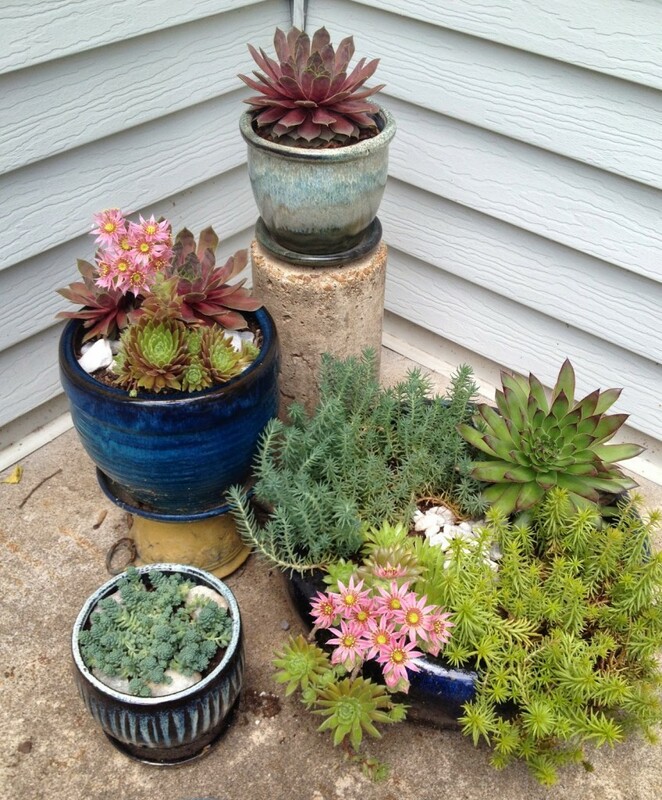 This year I re-potted my succulents, which include a couple types of Hens n’ Chicks and several seedum varieties. They are so happy they can’t contain themselves. 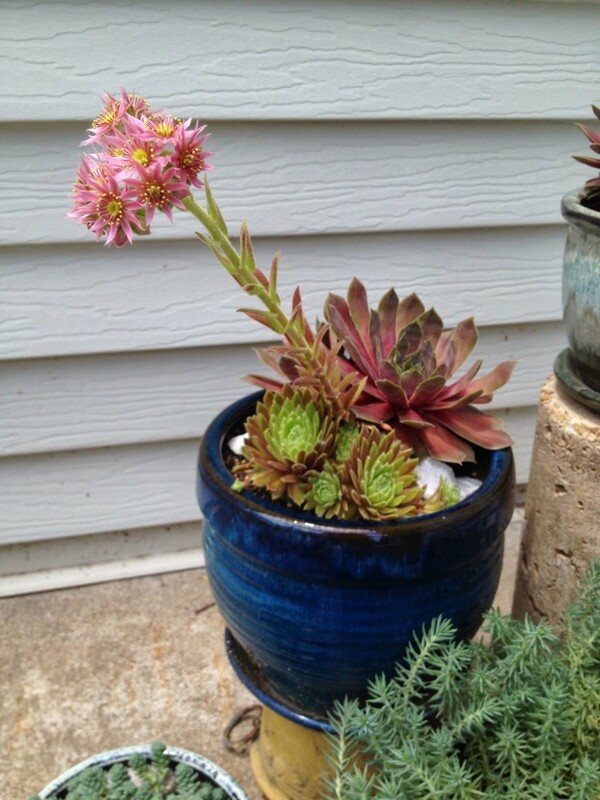 Look at this amazing flower! I can’t tell you how this happened. If you ask me what I did, all I can say is that aside from saying “hello” when I get home in the evening, I totally neglect them. So this was the year of the garden fence. 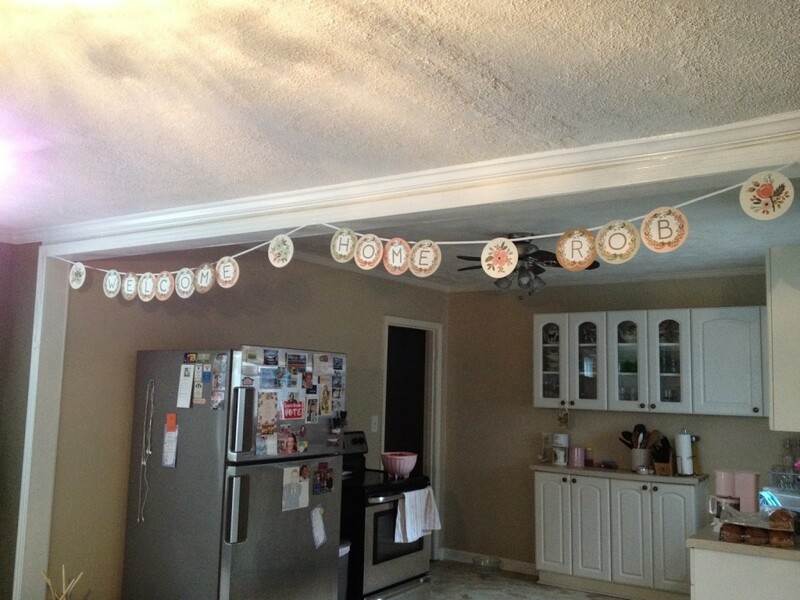 Well, I managed to fill the space with lots of yummy things that are on their way up. These pics are actually old because I’m a slacker, but I’ll post more recent ones soon. 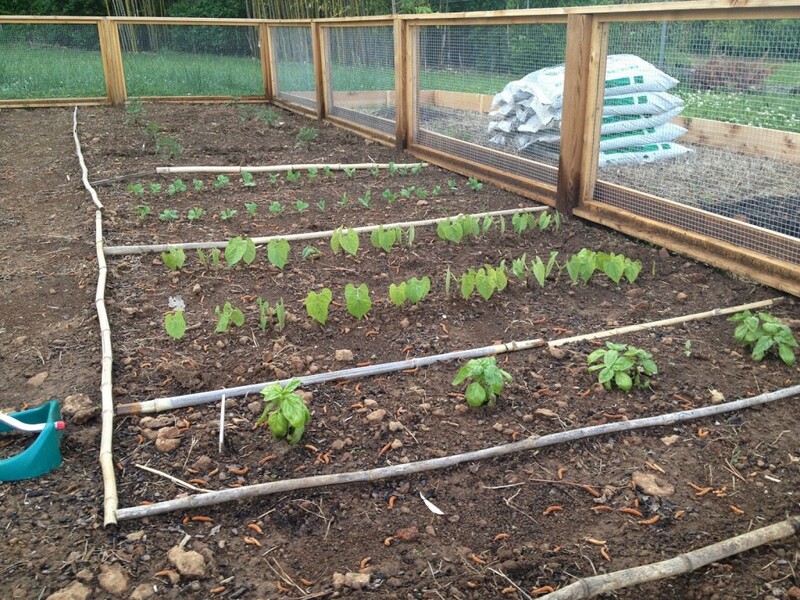 Here you can see basil, dragon tongue beans, snow peas, and Roma tomatoes in the background. Garlic (left). A mish mosh of onions (right). 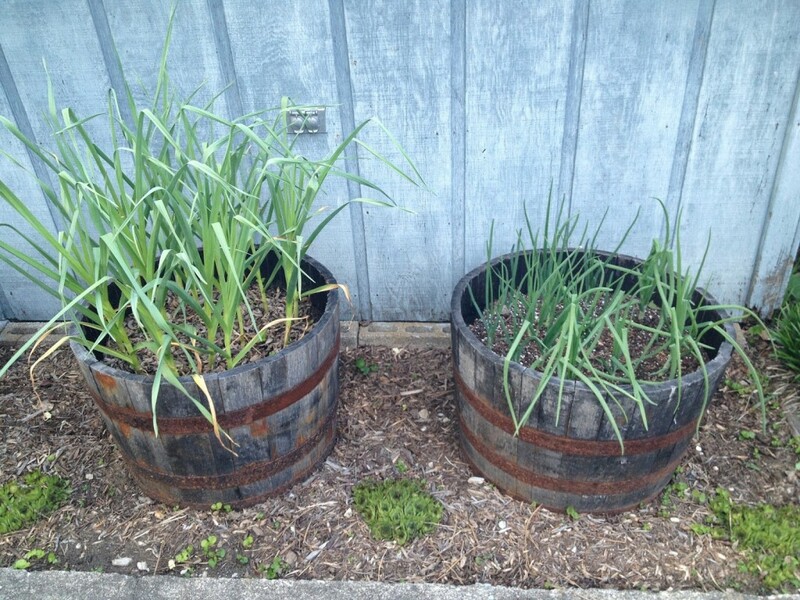 The squirrels think it’s funny to run through the whiskey barrels and knock the onions over. I am not amused. Started putting hay down around the squash since weeds are popping through and it will help retain moisture during the hot days we’re starting to get. I need to buy another bale. 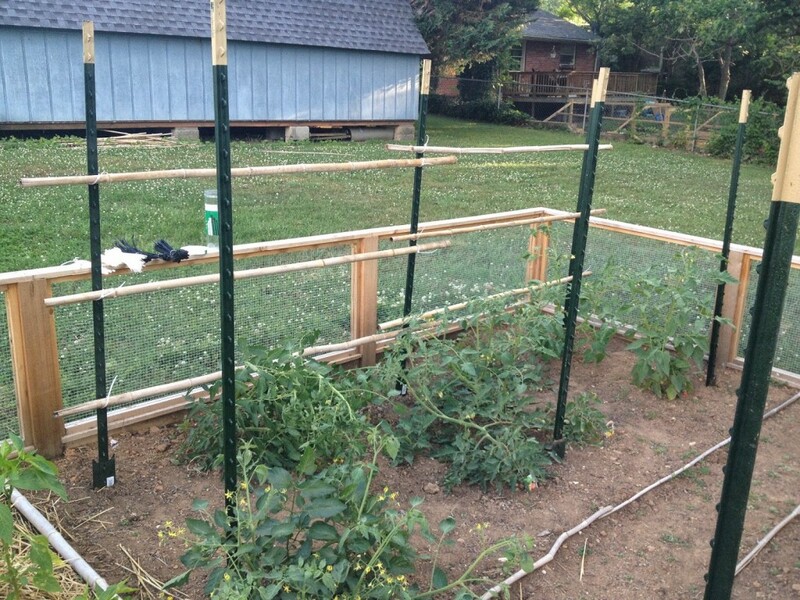 Tomatoes need to be staked. I’m thinking the best way to do this with this many plants (16) will be to put a stake at the end of each row and use horizontal bamboo as an open wall. We shall see. Everything is coming along really well! This is where I address all the exciting things that don’t fit in the thrilling categories above. The first is my fig. 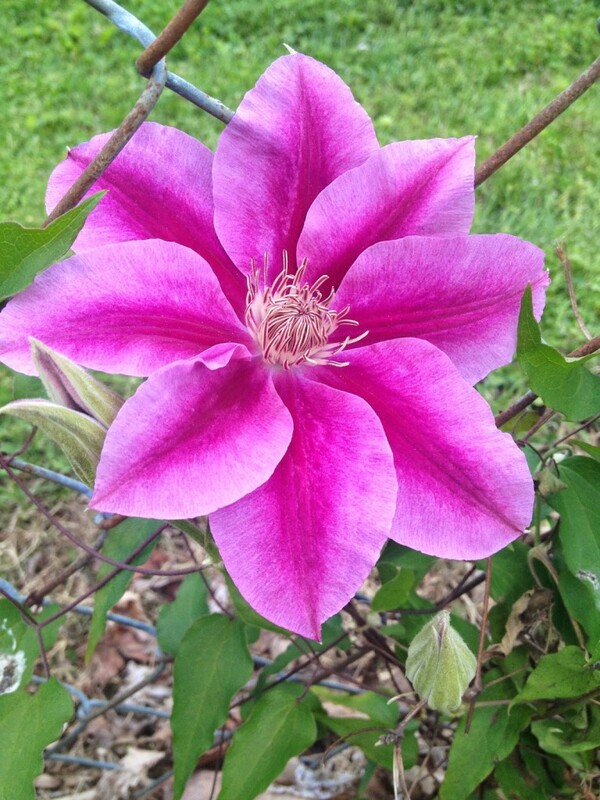 The winter in Tennessee was much colder than usual, which really ticked me off because I lost a clematis, a butterfly bush, and my fig. But wait! I didn’t lose the fig! After much hemming and hawing to Rob about how dismayed I was over the loss of the fig, this happened one day. The fig prevails! I was devastated one day when I looked out my window and saw that my squished roadkill bunny from last year had reincarnated himself as a cute fluffy NEW little bunny who also lives under my shed. How could this have happened?!?! I HATE BUNNIES. They are so adorable and so cute and so cuddly with their big eyes and soft fur…yet they have this alter ego that desecrates all that is sacred to gardeners with an evil twinkle in those big Disney eyes. 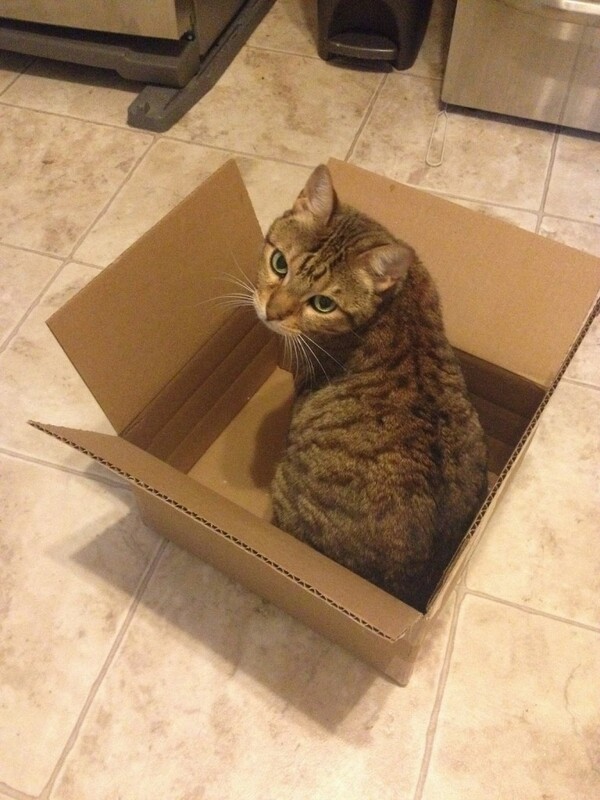 I plan to set a Havahart trap for this little guy. I can’t have him here. 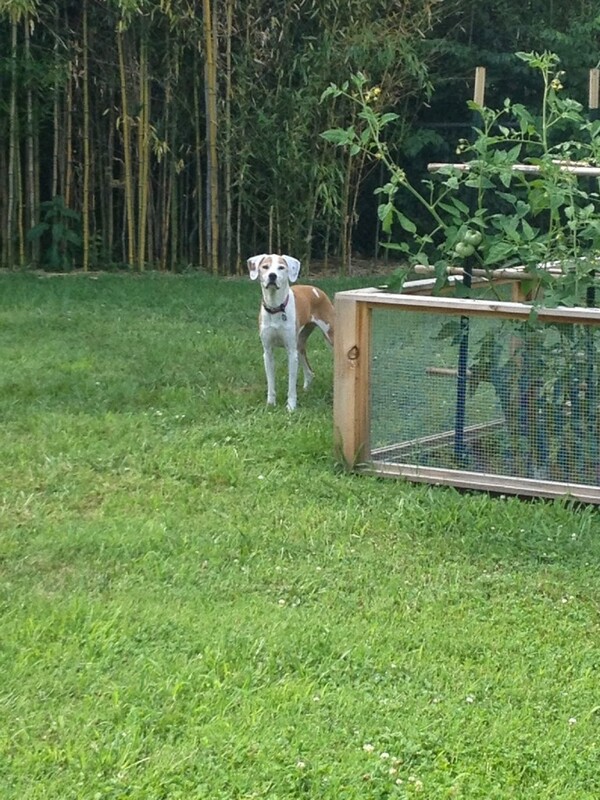 I know, I have the fence around the veggie garden, but he chewed the buds off my new Columbine, which is pretty much unforgivable in my book, so the evil creature must go. 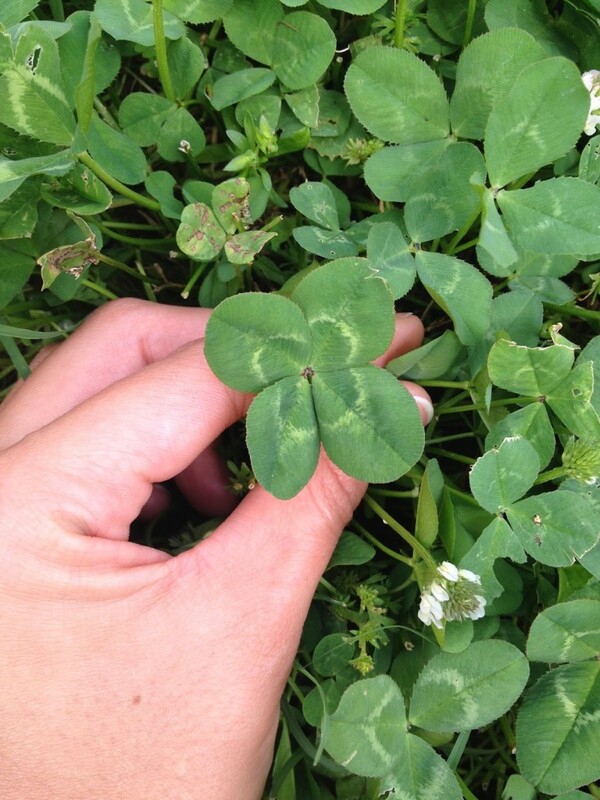 When I was growing up in Mattituck, our yard was a veritable treasure trove of 4 leaf clovers. There were patches of them everywhere. I swear the end of a rainbow must have landed on our house at some point in time because what else could explain this phenomenon? And then I realized that I have really good eyesight. Whether it’s spotting tiny pieces of sea glass on the beach, or a 4 leaf clover in a sea of ordinary 3-leafers, I can see these things everywhere. They’re actually not as uncommon as we’re led to believe. Truly, start looking and I bet you’ll find some. I ran across this one when I was scurrying between the garden and the shed with muddy hands and feet. Who knows, maybe the end of a rainbow landed in this yard one time long ago. It was my birthday the other day. Rob took me hiking in the morning, to Cheekwood in the afternoon, dinner later, and gave me this amazing garden tool which he said will most likely be what I will finish him off with one day. 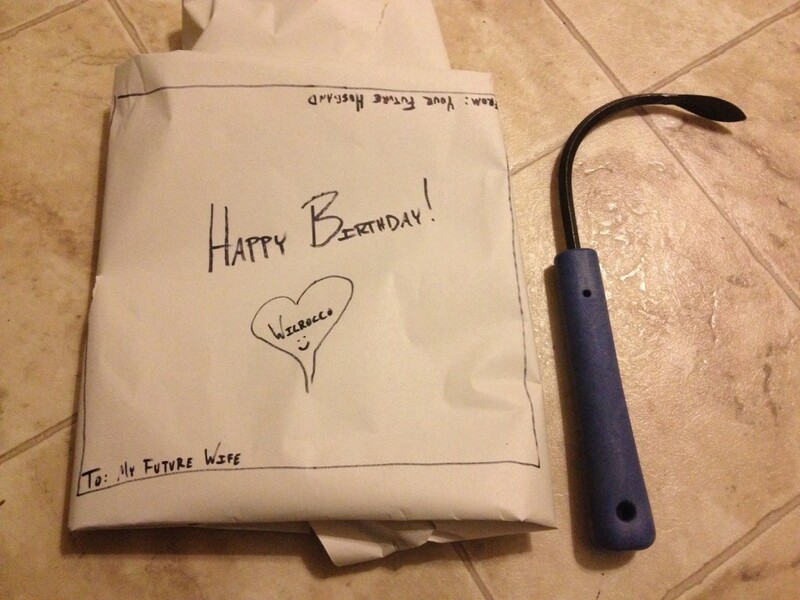 He has a machete lying in his garage, so I feel like the odds aren’t in my favor on that one. We can joke about these things before we get married without it being weird, right? This is my new obsession. It’s called the CobraHead Weeder & Cultivator. I’m telling you, I could get rid of every other thing in my shed that I use for weeding. I have the most horrendous wire grass in my garden that I am in a battle with to keep under control and this handles those roots like a champ!!! Forget tweaking my wrist with a spade, this thing rocks! I wish I had an endorsement and was getting paid to rave about this tool so they would send me free stuff, but alas, I am not so lucky. I want to buy this for all my gardener friends, but I don’t have enough money to do that, so be sure to trust me on this and buy one for yourselves.